During Sam's recent visit to Ireland, he spoke with the media about his participation in Londonderry's City of Culture 2013. He will stage the world premiere of his working of "Oedipus" in the city's Guildhall next year. He expressed his excitement about the project saying, "The material we are using is pertinent to the situation here. It's not as though we are doing something just for culture. We are doing it for a reason. The notion of 'place' is very strong here. There is where something happened. We explore destiny, fate, murder, exploitation, origins. The fact there is a wall round the city is part and parcel of what is going on in the play. I don't think there is anybody who cannot see there are repercussions with what is happening here." He adds, "It is important to have art and culture in a society go through transformation. Something is happening here. You can feel it. Putting on this type of play here takes on a different significance than say if we were going to New York. 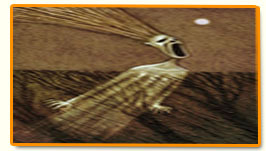 Where strife has been in the foreground, it is bound to have repercussions, or is bound to have meaning." This was Sam's second visit to Derry and he says he loves being involved at such close quarters - "I love being right in the middle of this place with the historical aspect of it. I love the people here. It's a funny sensation being in a place where you kind of have to tiptoe around certain subjects. It's like being in East Germany or something. But there is definitely a feeling that something is taking place here. Something still is up for grabs. It's not like any other place where things are just going on. Something is happening here. You can feel it." 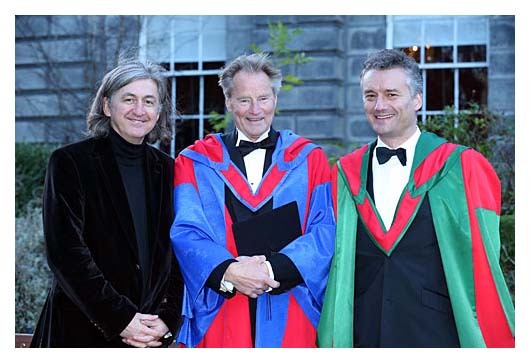 While Sam was visiting Trinity College last week, he also performed a reading. You can access the December 6th reading at this youtube link. 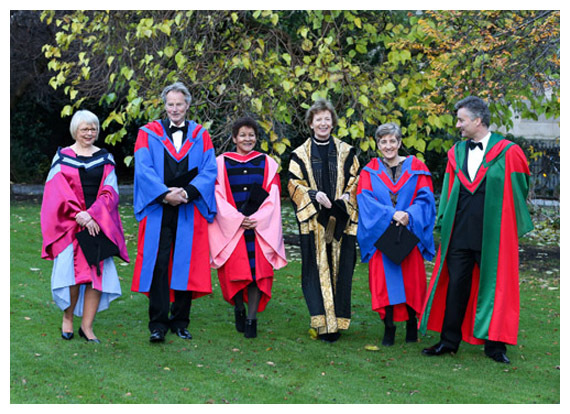 The public event was hosted by Trinity's School of English the evening before he was conferred with an honorary degree. Sam explained that he had been writing since 1963 so the material he was sharing spanned almost 50 years. With an obvious cold he was nursing, he sniffed his way through selections from Day out of Days, Motel Chronicles, True West, Curse of the Starving Class... One of my favorites was the "Berlin Wall Piece". At the end of his reading, Sam invited his great friend, Patti Smith, on stage, who read from one of their collaborative dramatic works before joining Sam in a duet of "Side by "Side", which was performed a capella style. It didn't work, perhaps due to Sam's cold and his singing off-key. However, he did successfully end the evening strumming his guitar while singing a folksy old ballard. 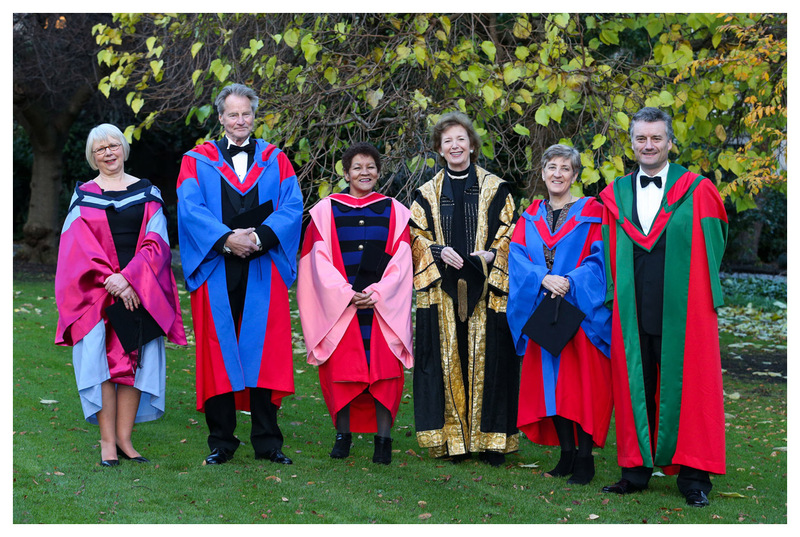 Associate Professor Eve Patten, Head of the School of English, commented, "It was a rare pleasure to listen to a writer of such extraordinary range and talent. 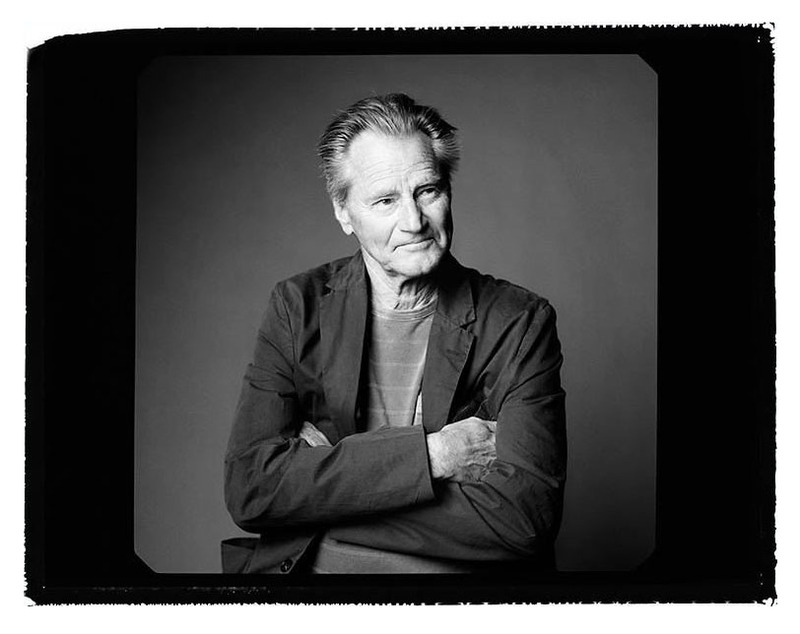 Sam Shepard gave us everything from prose poetry to dramatic monologue to comic memoir. His performance captivated the entire audience." A female blogger who attended the reading had the chance to shake his hand and tell him, "I had no idea you were so droll". Sam said, "Droll"? She replied, "Yes, droll" and imagined she detected a dislike of the word. She shook his hand firmly to tell him how much she enjoyed his droll prose. Say what! I highly doubt Mr. Shepard is not keenly aware that much of his writing is wickedly droll. This is just a little tidbit that I came across. Back when Sam's play, HEARTLESS, premiered in NYC on August 27th, an after party was held. I knew at the time that his daughter Hannah was there but what I didn't know was that son Walker and his band, the Dust Busters, provided the music. 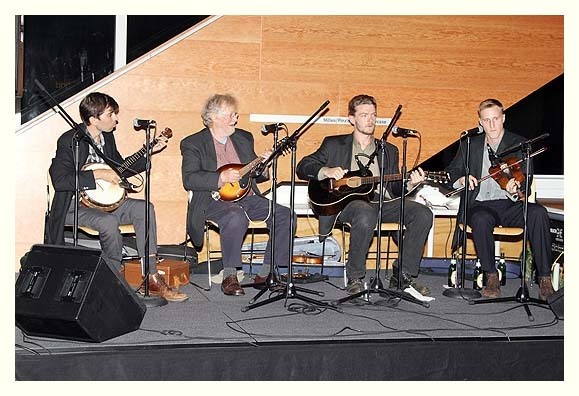 Describing themselves as an old-time string band, the Dust Busters are known for their ballads, fiddle and banjo tunes, and old-time songs. 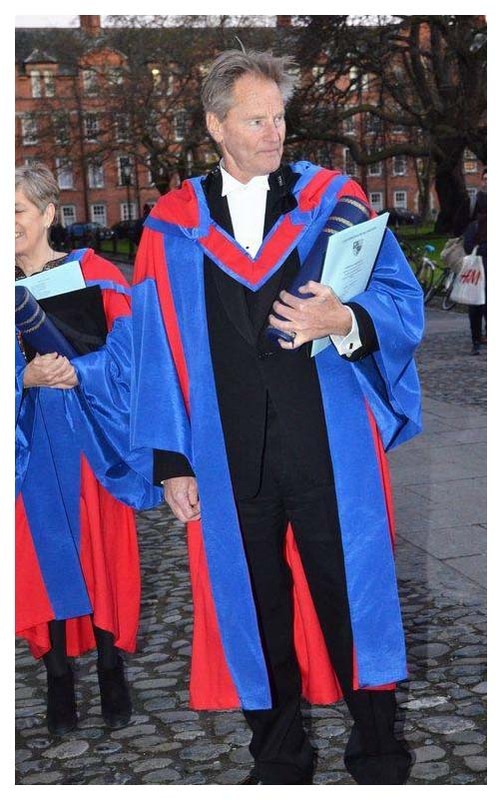 It was the work of Trinity student Samuel Beckett that proved the trigger for setting another Sam on the road to a life in theatre. 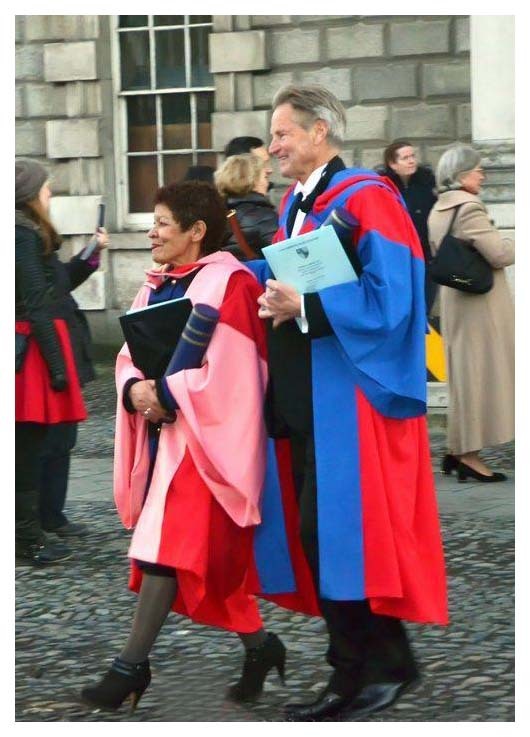 The Trinity connection came full circle when Sam received an honorary Doctor in Letters degree to recognize his contribution to world drama. 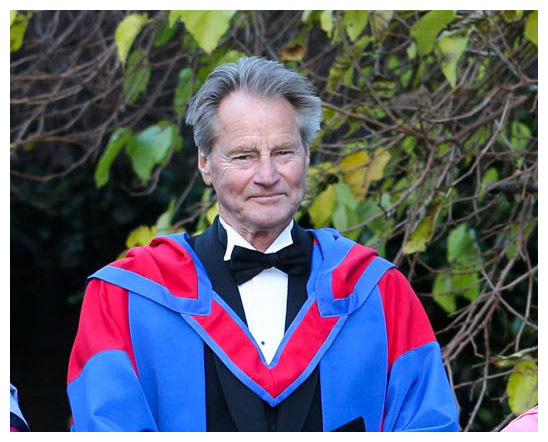 A press release from Trinity College Dublin: Playwright, actor and director Sam Shepard was conferred with a Doctor in Letters today (December 7). He is a significant figure in world drama, with an extraordinary body of work to his name which has inspired a generation of writers, filmmakers and theatre practitioners the world over. A relentless experimenter with form and structure, few American playwrights have exerted as much influence on the contemporary stage. 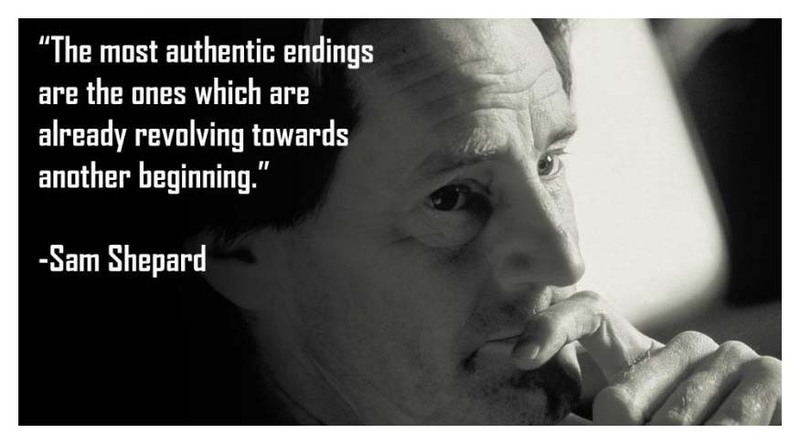 Not only a playwright, but also a screenwriter and author of short stories, he is the recipient of many awards, including the Pulitzer Prize for Drama in 1979 for his play Buried Child. He also has a deep connection to Irish theatre, expressed recently in an intensive artistic collaboration with the Abbey Theatre. 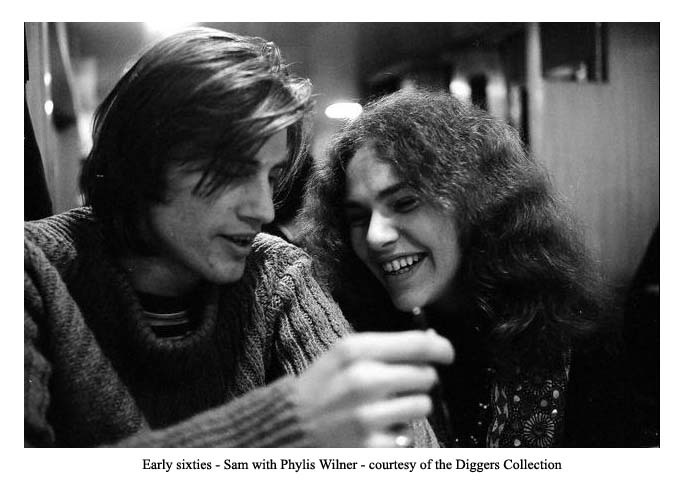 Sam was accompanied to Dublin by his life-long friend and former partner, rock star Patti Smith, and his sister, Roxanne Rogers. 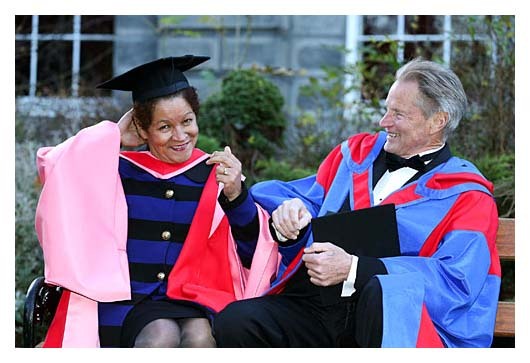 He described as a "great honor" the distinction bestowed on him by TCD. Today, he plans to travel Derry to begin work with friend Stephen Rea for a production of Sophocles's works, and will spend a few days there before flying back to New York. Adriana Baer, newly appointed as artistic director of Profile Theater in Portland, OR, has just announced that Profile will devote its 2013-14 season to the works of our playwright. 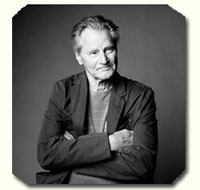 In a press release, Ms. Baer writes, "Sam Shepard has a uniquely American voice. Rural, rough, poetic, violent, and musical. His plays are distinctly of the West, rooted in dreams and longings we all recognize – for family, home, and self-understanding – but moving to their own rhythm. Shepard captures what it feels like to be an American – the good, bad, ugly, and profoundly beautiful... As a director, I find Shepard's work uniquely balanced between the sacred and the profane, and though sometimes absurd, each play is filled with emotional truth, working the heart as well as the psyche." Which plays she'll present and in what form (full productions or staged readings) will be pinned down over the next few months and announced sometime in the spring. The Country Playhouse in Houston, TX, will present "True West" in its Black Box venue for three weekends only, February 8 – 23. Performances are on Fridays and Saturdays at 8:00 p.m., with a Sunday matinee on February 17 at 2:00 p.m., plus a weeknight show on Thursday, February 21, at 7:30 p.m. For more information, visit this link. Ironweed Productions will present "Buried Child" at New Mexico's Santa Fe Playhouse from March 28 - April 14, 2013. It will be directed by Mona Malec. Performances are Thursdays, Fridays, and Saturdays at 8pm and Sundays at 2pm. There will be a preview performance on Thursday, March 28th at 8pm and a Gala Opening performance on Friday, March 30th at 8pm. Tickets for the Gala Opening are $25. For all other performances, tickets are $20 General Admission; $15 for seniors, students, teachers, and the military; and $10 on Thursdays. Tickets can be reserved by calling the Santa Fe Playhouse at (505) 988-4262. Back in October, the city of Derry, Ireland, announced a program of art events ranging from punk to painting to celebrate its role as the U.K.'s "city of culture" for 2013. It was further announced that it would include a new play by Sam, staged by Field Day, the innovative local company founded in 1980 by playwright Brian Friel and actor Stephen Rea. According to today's Derry Journal, this new play will premiere in April at The Guildhall. The Sundance Institute has announced its venue of films for its upcoming festival in January. 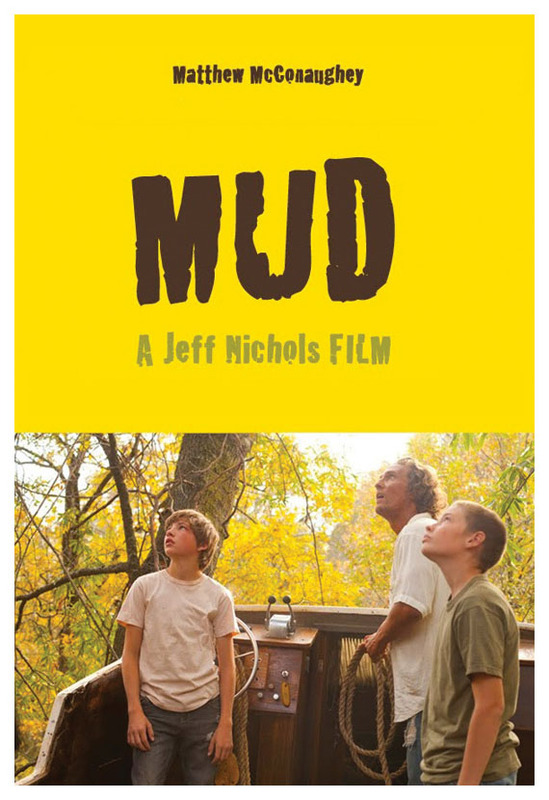 Among the films to be screened in their "Spotlight" program will be MUD, directed by Jeff Nichols. It was shown at Cannes in May and received very positive reviews. In August Lionsgate and Roadside Attractions acquired the rights to distribute the film in the US. Though they've announced it will be released in 2013, there are no further details as to what month. Matthew McConaughey stars as Mud, a man who's hiding from the law on an island in the Mississippi River. While there, he meets two young boys (played by Tye Sheridan and Jacob Lofland), who agree to help him. Also co-starring with Sam are Michael Shannon, Sarah Paulson and Reese Witherspoon. MUD was filmed in Arkansas in the fall of 2011. It was opening weekend for Andrew Dominik's new film, KILLING THEM SOFTLY and so far it has earned a respectable 78% on the Tomatometer. But if you're looking to check out those Shepard scenes, forget it! Critics agree that Sam has an all-too-brief cameo with one line of dialogue. He plays a legendary mob hit man named Dillon. My favorite praise comes from the Washingtonian - "Dominik is a virtuoso filmmaker, the sort of person who can bring balletic grace to settings as diverse as the dusty Old West, and the slimier corners of near-modern-day Boston. 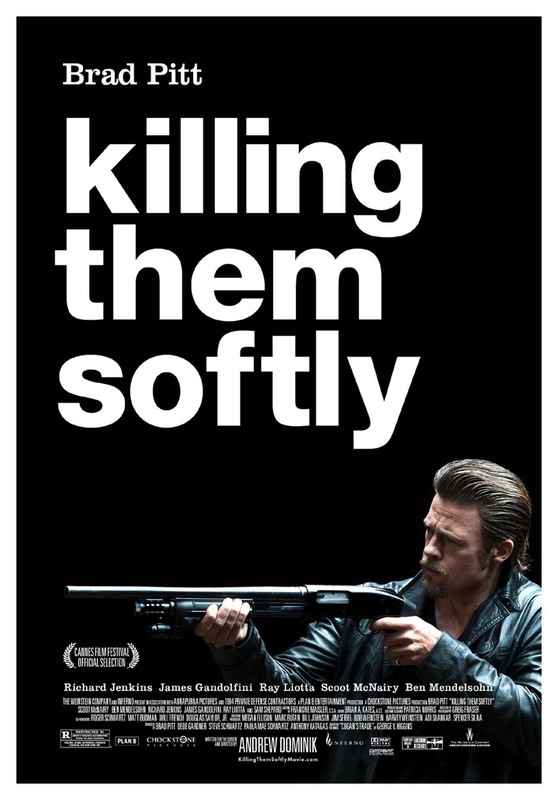 'Killing Them Softly' is a gorgeous piece of visual filmmaking from start to finish. But he’s nearly as accomplished a writer as a director. The dialogue he writes for his characters is lively and darkly hilarious. Nowhere is this more apparent than in the wonderful scenes between Brad Pitt and Richard Jenkins... The comic timing of the two actors practically makes one wish the entire film was just them talking, a quasi-philosophical gangland 'My Dinner With Andre'." Oh, what a gem that was from Wallace Shawn and Andre Gregory! 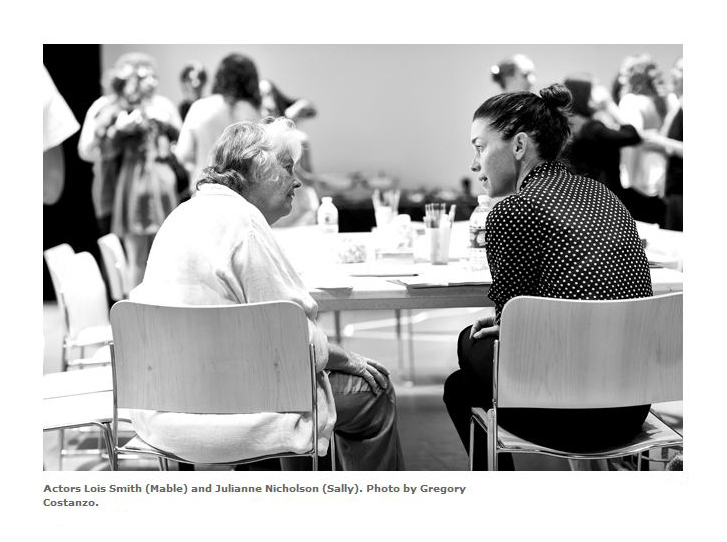 Last week Treva Wurmfeld's documentary, SHEPARD & DARK, was shown at DOC NYC. There was a Q & A following the screening and Johnny Dark shared the stage with his director once more. In the absence of a proper web site for this film, I have created one myself. You can check it out by clicking on the above title. The film has now been screened at three film festivals and Sam has been a no-show each time. In the Q&A after the screening at the IFC Center, Dark was asked if his friendship with Shepard often changed throughout the years, to which he replied, “The friendship only changed once, and she filmed it.” The epiphanies revealed to these two men as they reflected on their lives and perceptions was described as a moving, bittersweet story - one that Dark told the audience he advised Shepard not to see. Interesting.. 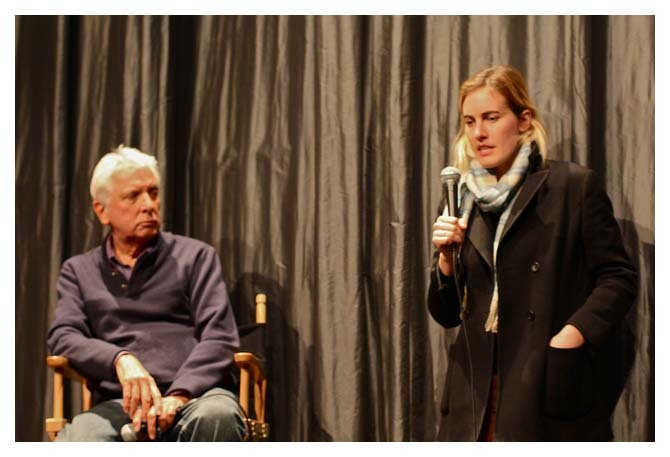 The Woodstock Film Festival wrapped up today and director Treva Wurmfeld's film "Shepard & Dark" was honored as Best Feature Documentary and Best Editing of Feature Documentary. Well done, Treva! Here is an excellent link to an video interview with her in Toronto last month. The film will be screened next month at DOC NYC, New York's premier documentary festival, running from November 8-15. One of my favourite films at the Festival so far, out of a particularly impressive program of documentaries, is "Shepard & Dark". Harking back to a pre-digital age, the film celebrates the lost art of letter writing and archives the very process of creating an archive, with all the personal dramas it can entail. 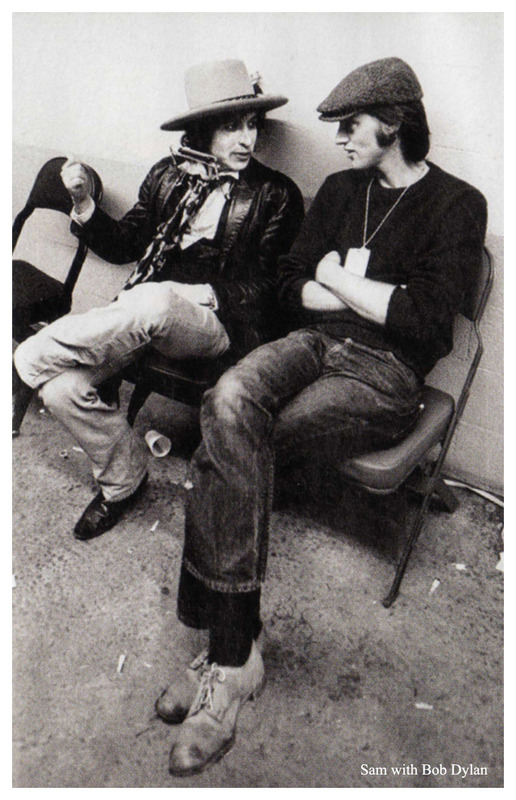 When they met in Greenwich Village in the 1960s, Sam Shepard and Johnny Dark had immediate chemistry. Since this first encounter, when they bonded over their fathers and love of writing, their lives have been intertwined. After Shepard and Dark married into the same family, the two lived together for many years, until Shepard left home in 1982. No longer together each day, the two men continued to write each other faithfully. When Shepard and Dark decided to publish their correspondence in 2010, director Treva Wurmfeld began to observe their experience. 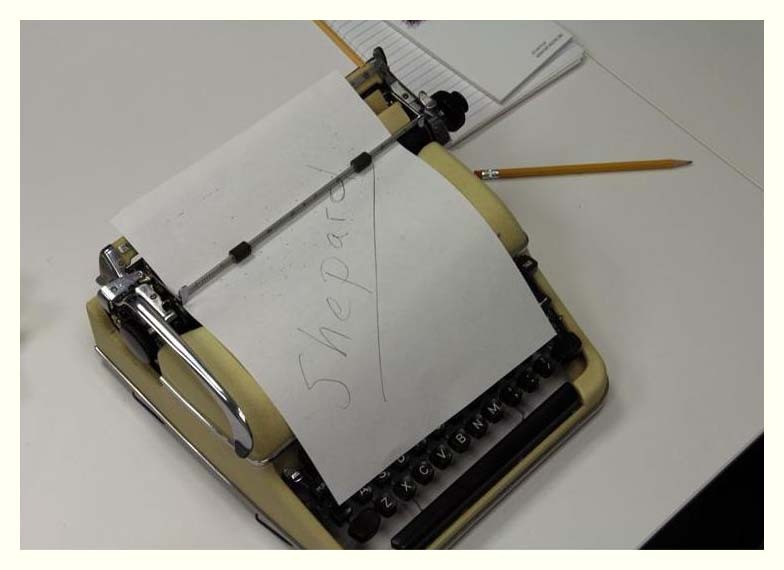 In "Shepard & Dark", we tag along as she follows the two buddies over the course of eighteen months, pouring over old letters and reflecting on the past. Throughout the film, Wurmfeld is able to capture valuable moments in which the men share humble pearls of wisdom – Dark from his living room chair, surrounded by his dogs, and Shepard from wherever on the road his cowboy way of life takes him. With Shepard and Dark’s relationship, Wurmfeld has excellent subject matter, and the simple eloquence of her filmmaking manages to do it justice. Shepard is well known for his Pulitzer Prize-winning playwriting, along with his work as an actor and director, while Dark has remained content juggling an assortment of odd jobs, from dogcatcher to deli worker. What’s refreshing about Wurmfeld’s film is that it doesn’t focus on Shepard’s fame, leaving more room for all the complexities of a years-long friendship. The film nuances the age-old story of how opposites attract and, despite the flare-ups that often arise, remain connected for a lifetime. 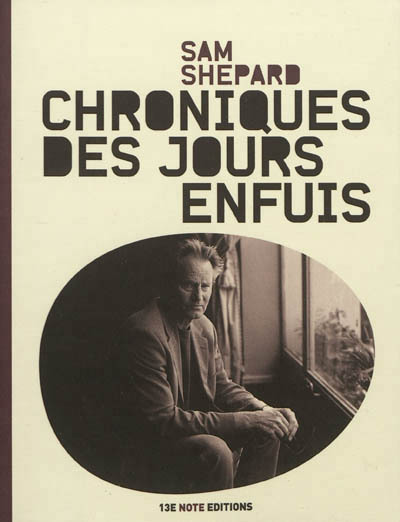 We come to know Shepard and Dark as two different incarnations of beatnik philosophy: Shepard is always on the move, struggling with the alcoholism in his family, while Dark, admitting to his laziness, prefers to stay at home getting stoned, immersing himself in writing and photographs. Indeed, the two remember Jack Kerouac with great affection, and together sing Bob Dylan tunes. In this respect, the film offers a more humble take on the beat-inspired culture explored elsewhere at TIFF, namely in Walter Salles’s new film "On the Road". Tensions emerge as Shepard and Dark sort through their old material, speaking to universal experiences of friendship that we can all relate to. Balancing out these sad, even uncomfortable, moments are the comedic touches that are generated by their quirky personalities. Dark, especially, comes into his own here, as in the scene when he eats hash cookies before sitting down to work at The Santa Fe Institute. The duo’s ineptitude with technology also gets some laughs. It’s amusing to see two great minds stumped by the function of a USB key – a scene that reminds us that Shepard and Dark come from a different age of scribbled lines and typewriters, and sometimes struggle to keep up with the times. As the friendship oscillates between these highs and lows, we come to understand the bond between Shepard and Dark beyond their communication, as an unspoken connection that is also able to withstand the periods of silence which come with conflict. In her portrayal of this implicit bond, Wurmfeld offers a more poetic vision of the bromance that has recently exploded on screen. We see the two men without their women, attempting to define themselves as individuals late in life. Ultimately, they are joined together by their respect for each other’s solitude, remaining both alone and together for their whole lives. It's come to my attention that Sam and Wim's collaboration on "Don't Come Knocking" began in 2000 with a screenplay entitled "In America". It was discussed in the November 12, 2000 magazine section of the NY Times by Wim himself. The screenplay under that name has been archived in the Wittliff Collections at Texas State University. The film was originally to be shot in January 2001 with it later being pushed to the spring of 2002. 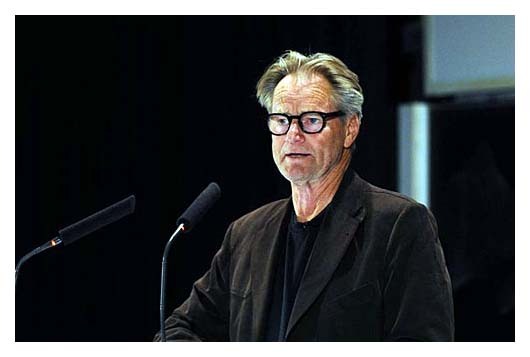 In September 2001, Wim announced that the male lead would be played by Mark Everett, aka E, the leader of the rock band, "Eels". 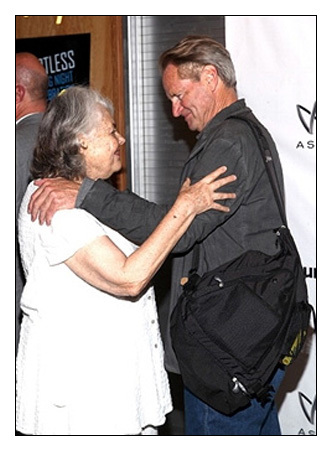 In June 2002, Wim commented on the film - "It's a family story, which we are shooting mostly in Montana. It had a working title of 'In America' but that title has to remain a working title because, in the meantime, a book came out with that title by Susan Sontag, so I guess we can't use that title anymore." Of course, in the end, Sam took on the lead role and the film premiered at Cannes in 2005. It just so happens that "Shepard & Dark" will be making its US premiere in my hometown! 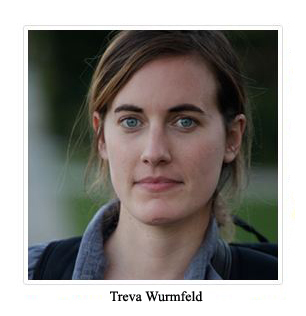 The Woodstock Film Festival has just announced its documentaries in competition and its schedule includes the screening of Treva Wurmfeld's film on October 11th at the Utopia Studios in Woodstock. 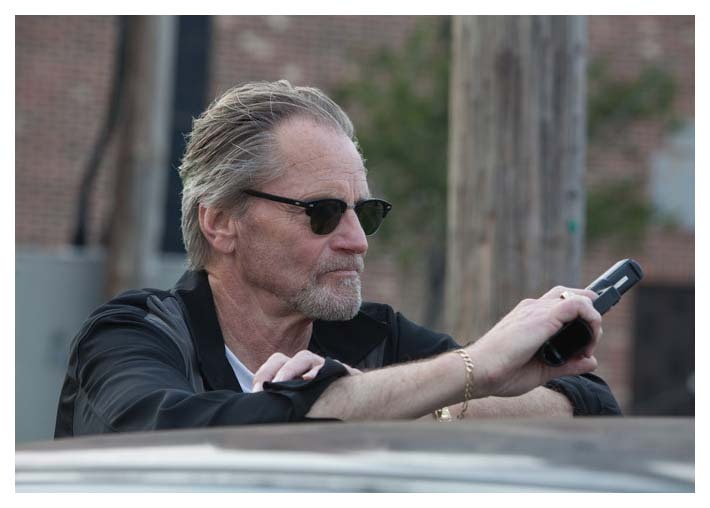 The ups and downs of a decades-long friendship are charted with warmth and sensitivity in "Shepard and Dark," documentarian Treva Wurmfeld's intimate portrait of playwright-actor Sam Shepard and his far less accomplished buddy Johnny Dark. Spanning 18 months, the pic follows the pair as they sift through the reams of soul-baring correspondence that have passed between them and ponder how to package the letters in book form. Somewhat taking the place of that unrealized project, Wurmfeld's film subtly reveals the tensions that emerge between two kindred spirits with vastly different views of work. A limited but appreciative audience awaits. Shepard devotees will naturally find the film essential, in part for its unstinting focus on the artist's early '80s decision to leave the surrogate family he had established with Dark. At the same time, Wurmfeld is careful to locate the universal truths in the men's friendship and to engage even those who've never heard of Shepard. Among the pic's gently observed subjects is that of whether a couple's collective talent for disclosure and reflection inevitably threatens to turn toxic over the long haul. We invent stories, narrative personas fixed in autobiographical form, to understand ourselves. For some of us, these stories are modest ones — simple acceptances of conventional social roles. For others they are grander, more mythic. 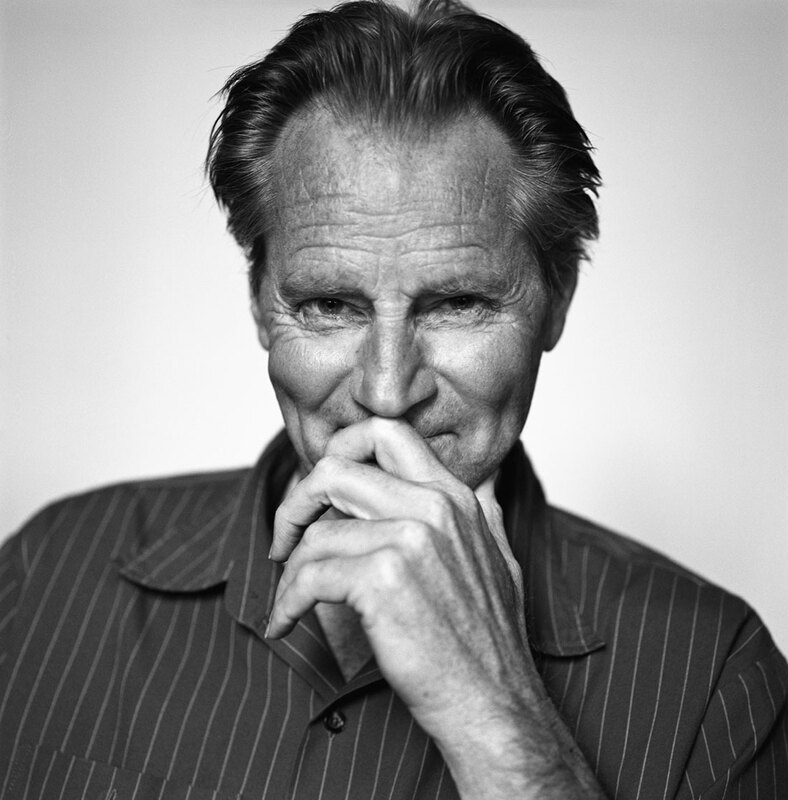 Throughout his life, Sam Shepard has created compelling fictions about not only the postwar American man, but America itself. The restless characters of his plays, often the product of turbulent families, invent and reinvent themselves, reinvigorating the concept of the American frontier experience along the way. These characters are echoed in Shepard himself, a romantic figure, both Hollywood star and loner artist, relentlessly following his own private path. In Treva Wurmfeld’s "Shepard & Dark", Shepard and his various well-crafted personas are engagingly captured in all their correspondences and contradictions. 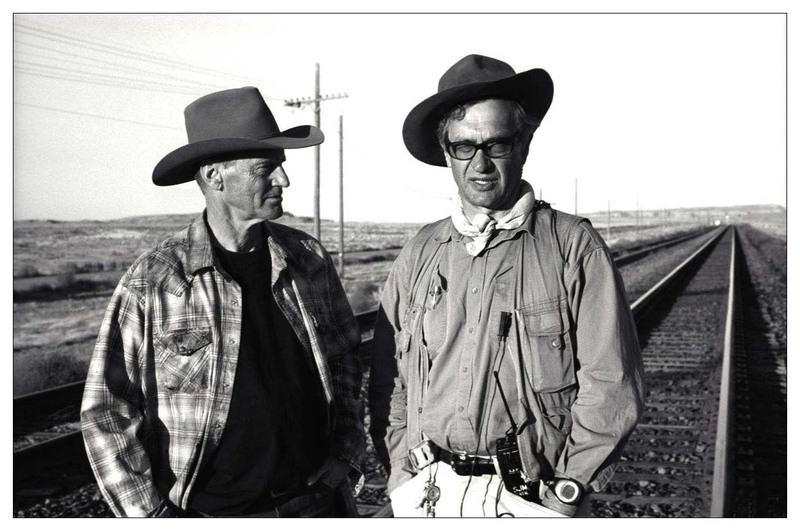 And, cleverly, Wurmfeld has managed to make a great Sam Shepard documentary by making it about something else entirely — namely, his 40-year, often epistolary friendship with Johnny Dark, a quiet writer and archivist who works days behind the counter at a Santa Fe deli. 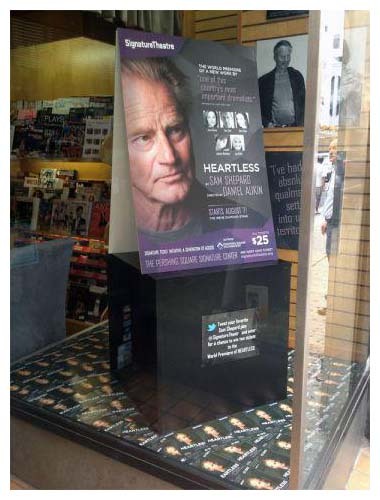 "Creativity and Conflict in the Plays of Sam Shepard" by Jyotirmoy Prodhani was published last month by Authors Press. The 168-page book makes a critical enquiry of his Rock Plays to evolve a fresh perspective to understand the processes of creativity and the crises of artists in the backdrop of altered cultural cartography which is not only abiding American but has also turned out to be a lasting reality across cultures in the era of postmodern cultural politics. How exciting that our playwright will be playing Meryl Streep's husband in the upcoming AUGUST: OSAGE COUNTY, based on the play by Tracy Letts. Sam has the small but important role of Beverly Weston, a former college professor and one-time famous poet, who has resigned himself several years ago to heavy drinking to coexist in the same house with his drug-addicted wife, Violet. The character makes a brief appearance in the beginning of the story and his disappearance sparks a gathering of the family at the ancestral home. The result is a comedy and a drama of epic proportions. The three-month shoot, directed by John Wells, will begin filming in Oklahoma next month. Besides Meryl and Sam, the cast includes Julia Roberts, Juliette Lewis, Chris Cooper, Dermot Mulroney, Abigail Breslin and Ewan McGregor. 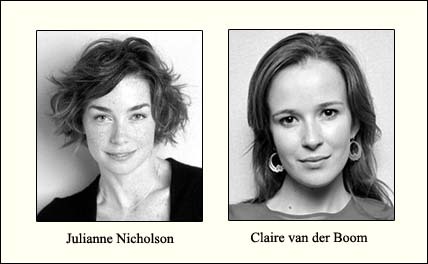 Australian actress Claire van der Boom will join the HEARTLESS cast starting September 18th. 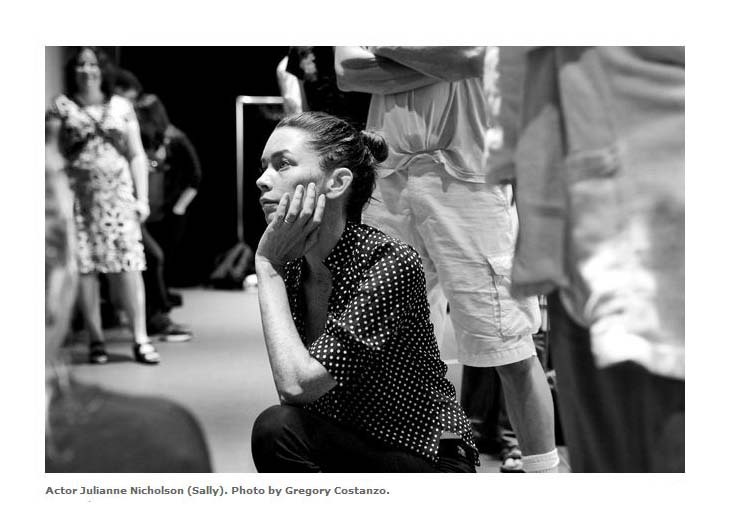 She'll take over the role of Sally, originated by Julianne Nicholson, whose prior commitments prevent her from performing during the two-week extension through September 30th at the Signature Theatre. 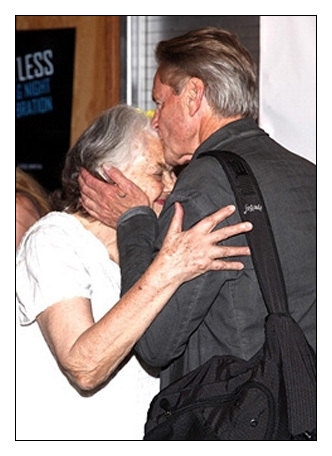 That commitment happens to be a role in "August: Osage County" along with Sam! I've added a few more reviews to the "Heartless" page. Look for the "new" icon. I have to point out a comment from Terence Diamond of Edge Boston. 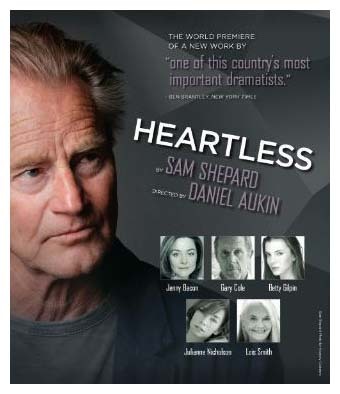 Though "Heartless' does not fall into this category, he relates how a certain playwrighting teacher of his called Shepard’s work "the ballscratcher plays". He explains, "Ballscratcher playwrights pen the manly man plays in which the protagonist ruminates on the meaning of the universe while figuratively if not literally scratching his bits. He usually takes lots of time to do both." It doth tickle my funny bone! 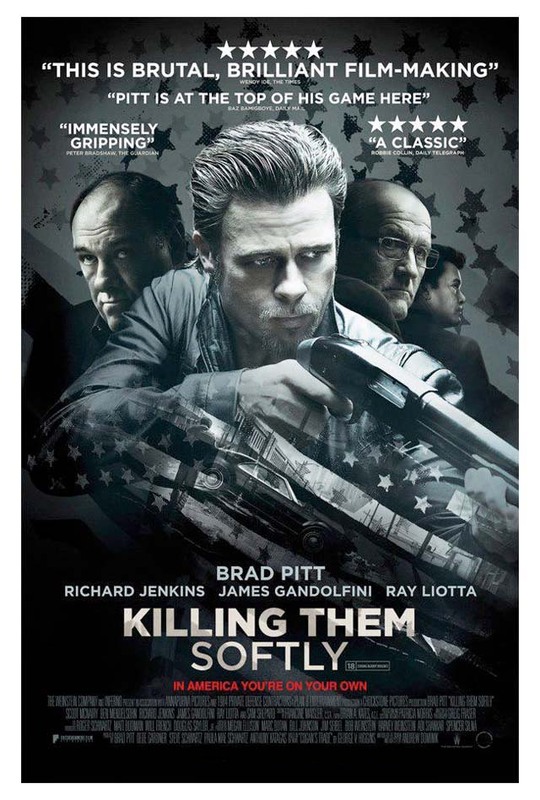 For the second time in two months, KILLING THEM SOFTLY has changed its release date of October 19 to a wide release on November 30. Harvey Weinstein pointed out that there are no other major wide releases scheduled for that date, meaning the film could find a significant audience. By releasing at the end of November, it could also be fresh in Oscar voters' minds for consideration. The film debuted at the Cannes Film Festival in May to strong reviews, and was noted for being a gangster drama that also worked as treatise on the current American economic woes. As you can see from the photo below, Sam is not to be messed with. Here are a couple photos taken yesterday at the Toronto Int'l Film Festival. The first one shows film editor Sandra Adair with director Treva Wurmfeld and Johnny Dark. I've often wondered exactly how Johnny Dark and Sam met. It turns out that Johnny met Sam by accident after seeing one of his earliest plays in 1963, invited him over for spaghetti with the family of this older woman Scarlett, who he was seeing. Scarlett had a daughter named Olan and ultimately Johnny married Scarlett while Sam married her daughter. 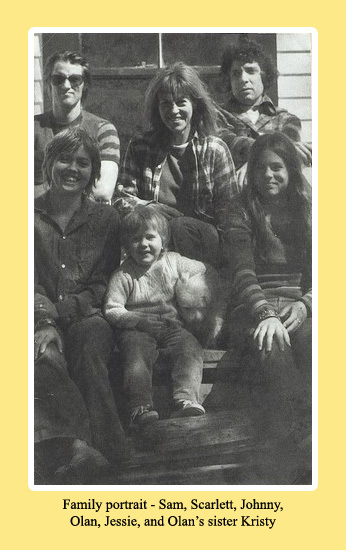 Here's a family portrait from Johnny's book, "People I May Know". More like a lullaby than a campaign song or an anthem, John C. Reilly’s “Hey Mr. Old Guy” from his epic “Walk Hard” soundtrack kept me consoled for the two years that I worked on my documentary film, SHEPARD & DARK, which is premiering today at the Toronto International Film Festival. 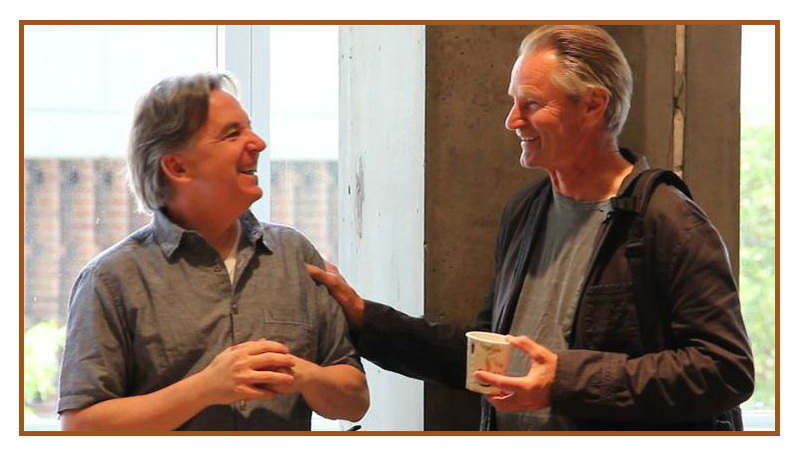 “Shepard & Dark” focuses on legendary playwright/actor Sam Shepard and his complex relationship with long-term friend Johnny Dark – a writer and archivist who lives in Deming, New Mexico and works behind a deli counter. The film unfolds in earnest; capturing an honest, and often comedic, portrait of two male friends with a rich history, now close to the border of decade numero siete. Sam and Johnny both have a strong aversion to modern technology and seem to resist anything that might come along with the modern era. In general, they cling to a Beatnik spirit of adventure that one associates with teenagers reeling to break free from the confines of authority. Sam still uses a typewriter, and has a collection of Scorpion-themed paperweights. Johnny prefers an 80s word processor and drives a 1970 Chevy Nova. Neither of course have email. Both avoid airplanes. And they bicker like nobody’s business about Bing Crosby vs. Tony Bennett and what time they should eat dinner. Making a film about these two men posed some unique challenges, almost a comedy of errors if you will. Between the novelty of my video camera, and my age/gender – which neither seemed to associate with any semblance of serious professionalism – I was never quite sure if they understood me, or what I was doing there. At one point they even started referring to me as an alien. At times, I ironically felt like the Euro-centric Anthropologist attempting to “study” the non-western people. How could I leave my modern ways behind and assimilate into their culture? In reality I’m a feminist filmmaker and I pride myself on my independence not to mention my tech-savvy ways – but here I was attempting to document these luddites and well… let’s just say, not quite feminist men. 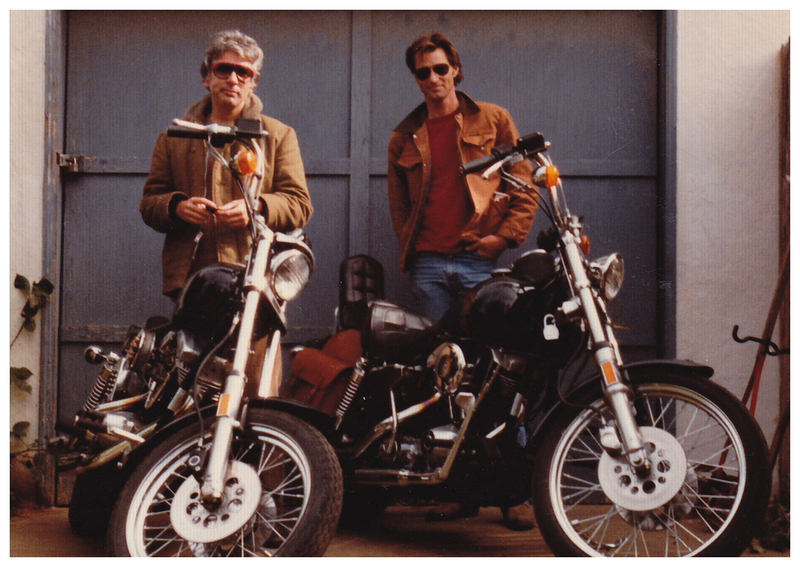 Ultimately, I filmed Sam and Johnny on and off over an 18 month period, in New Mexico, California, Kentucky and Texas. Despite the camera always on my arm, over time, I slowly began to feel drawn into some of their “old man” ways. I started writing hand-written letters and spending days traveling by car, staying in road-side motels. I would sit at the Denny’s counter with Johnny and share an ice-cream sundae. I even started taking harmonica lessons. In effect, rather than channeling the old man in me – it turned out – I just needed to channel the rebellious 50s teenager. What I learnt was that Sam and Johnny had made such an effort to not turn into their fathers that they themselves had never quite grown up. The final result is a film that I feel captures a human spirit that transcends age or gender. 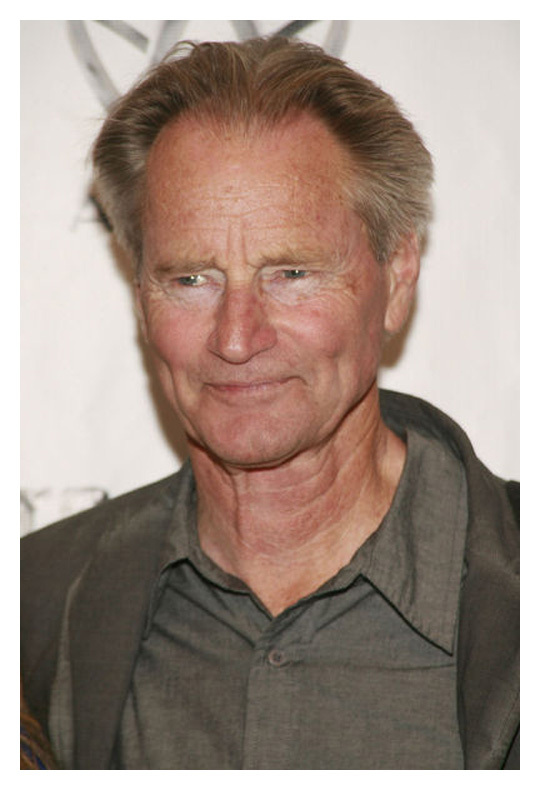 Screen Daily Review of "Shepard & Dark"
Shepard, of course, is the Pulitzer-winning playwright and actor Sam Shepard, known for his acclaimed plays Buried Child and True West, and nominated for an Oscar for The Right Stuff. But who is Dark? As this intimate, breezy documentary reveals, Johnny Dark is one of Shepard’s oldest and most faithful friends, a reclusive eccentric who lives in small-town New Mexico. 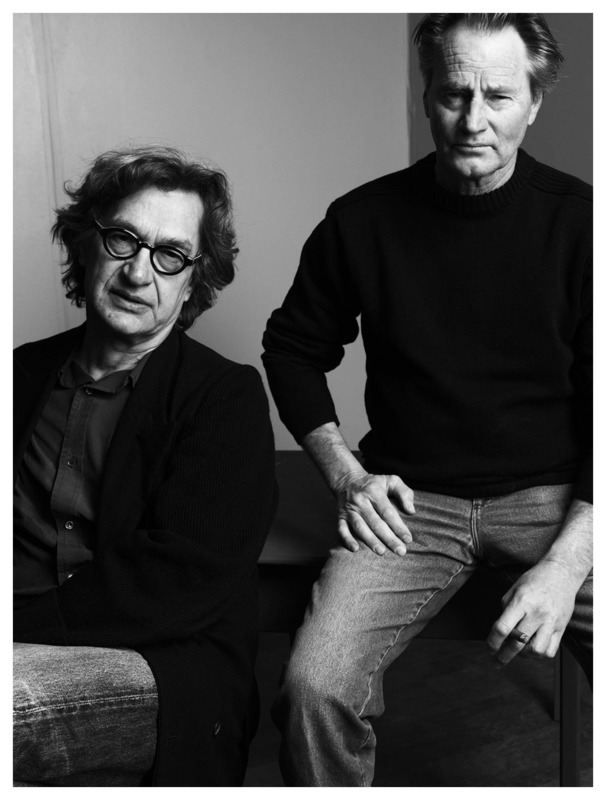 When the two men embark on a book project to publish their decades of correspondences, old wounds and memories are re-opened—but only briefly. While "Shepard & Dark" hits a few grace notes, it’s strictly conventional small-screen fare, likely to find audiences wherever Shepard is a known commodity. For 18 months, filmmaker Treva Wurmfeld documented the aging men, traveling back and forth between their homes and, eventually, to Texas, where the duo began sifting through their old letters. It’s quickly apparent that the two men are very much an odd couple. In the film’s opening moments, Dark admits that friends don’t need to be alike; rather, they are “complementary.” Indeed, Shepard is peripatetic, always on the road, struggling to balance his needs for solitude and companionship; Dark is hermetic and happy to stay at home with his two dogs - “I don’t like knowing people,” he jokes. But their differences come into sharper, more resonant focus when Dark recounts their past. After Dark married an older woman named Scarlett, Shepard married her daughter, O-lan Jones, and the two couples lived together for years. Shepard abandoned the family in 1982 and left Johnny, the homebody, to help raise Shepard’s son at the vulnerable age of 12. Because Dark is an amateur archivist, saving every scrap of writing, photo and video from his past, Wurmfeld has a wealth of material to draw from: Particularly affecting is video footage of Dark’s wife Scarlett, as she struggles to recover from a brain injury and the family tries to take care of her. 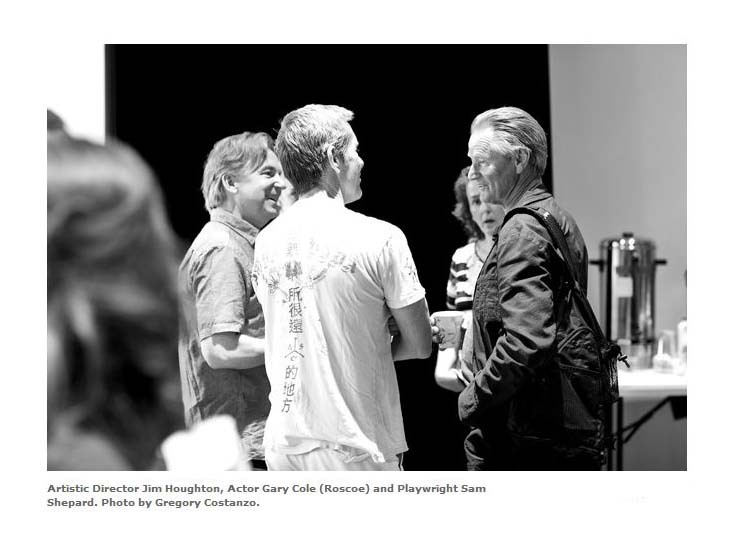 And while we see brief glimpse of rehearsals of a Shepard play with Nick Nolte and Sean Penn, "Shepard & Dark" is less about Shepard’s creative work than his personal relationships. In fact, audiences who don’t know Shepard’s background will be left in the dark as the documentary offers little details of his accomplishments. "Shepard & Dark" is also light on personal revelations. But when they do come, as when Shepard makes the surprising admission, “I continue to make the same mistakes,” the short-lived moments are powerful. However, Shepard, a man who doesn’t believe in all that psychology stuff and actively resists reliving his past, doesn’t make for the most compelling documentary portrait. At another crucial moment of painful introspection, he turns away from the camera: “I can’t do this,” he says, choked up about either his break-up with Lange or the regrets he has for leaving his family. We’ll never know which. 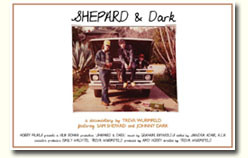 If Shepard is closed, Dark is open, and a far more eccentric and interesting character, with a penchant for marijuana, Jack Kerouac (whom he knew), care-giving and walking his dogs. But, alas, Shepard being the celebrity, viewers may leave the documentary wanting more. 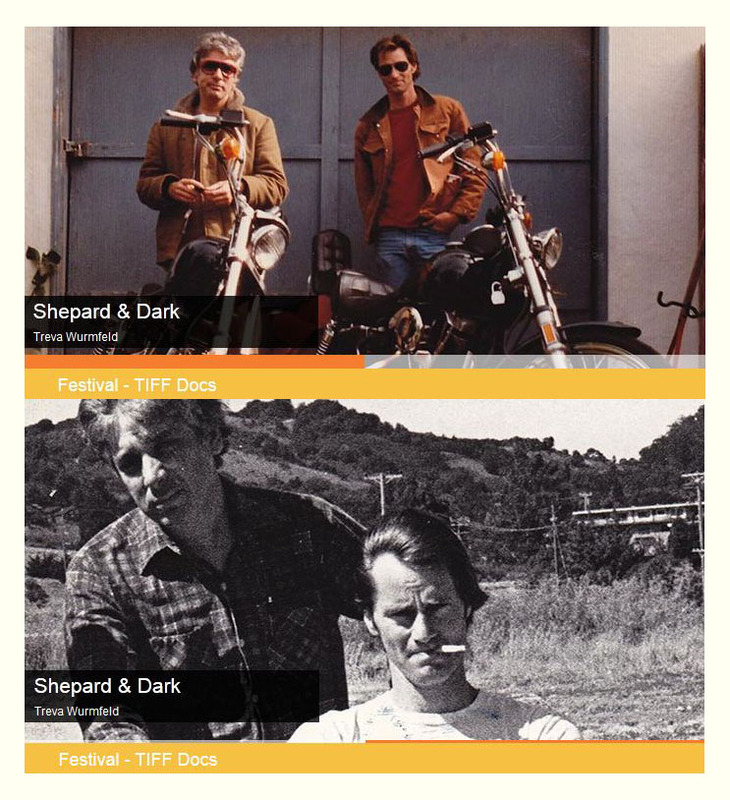 TIFF program notes for "Shepard & Dark"
Sam Shepard and Johnny Dark met in Greenwich Village in the early 1960s and, despite leading very different lives, have remained close friends ever since. Shepard became a Pulitzer Prize–winning playwright (Buried Child) and an Academy Award®–nominated actor (The Right Stuff), while Dark was a homebody with a penchant for letter writing and photography, supporting himself with odd jobs — from dogcatcher to deli worker. Through the decades, they stayed bonded by family ties. Dark married an older woman named Scarlett; Shepard married her daughter. The two couples lived together for years until Shepard broke away for another relationship in 1982, leaving Johnny to help raise Shepard’s first son. Nevertheless, he and Dark continued writing to each other, amassing hundreds of letters. Director Treva Wurmfeld began filming the two friends in 2010 during a period of transition and reflection for Shepard. He had quietly ended his relationship with Lange at the time and accepted a proposal to publish his correspondence with Dark. The task required them to meet and sift through years of their shared history, stirring memories both good and bad. Wurmfeld observes the two men, separately and together, over a period of eighteen months and captures an indelible portrait of a complex friendship. On the surface, they are like jovial siblings, having laughs at each other’s expense, but as they trace back four decades of experience, each man taps into deeper subjects of love, duty, fatherhood, illness, grief, passion, money, art, freedom and isolation. Shepard has an avowed aversion to writing his memoirs and prefers to let his work speak for itself. However, with rare intimacy and access to a rich archive of old photographs and family movies, Wurmfeld manages to unveil the past in a way that speaks both to Shepard’s work and to his current state of mind. Shepard has always had an arresting screen presence, from his first appearance in "Days of Heaven" to his latest work in "Mud". He’s equally compelling as himself, and well-matched playing opposite the screen debut of Johnny Dark. On August 28th DARLING COMPANION was released on Blu-ray and DVD. Personally, I don't know why anyone would want to purchase it with the majority of film critics taking it over the coals. Sample review: "'Darling Companion' may be the first film consisting entirely of footage resembling the background action in an erectile dysfunction commercial. (Clever observation!) It has the score of a Campbell’s ad, the premise of a Hallmark card and the script of a self-parodying Lifetime dud. Side effects may include headaches, irritability and a guaranteed loss of interest. What possessed Diane Keaton, Kevin Kline, Richard Jenkins, Dianne Wiest and Sam Shepard to sign on to this dreck? Perhaps it was the once illustrious reputation of writer/director Lawrence Kasdan. To be fair, none of these overqualified actors are delivering bad work - they’re just playing a losing game." We finally have some good-looking posters for KILLING THEM SOFTLY! They didn't even have a photo of the awesome Brad Pitt on their first release. The poster on the right is for international distribution. IndieWire reports that when they caught the film at Cannes, they called it "breathtakingly brilliant and admirably ambitious" as well as "angry" with the filmmaker painting not just a story about the fate of some hoods who knock off a mob-protected poker game, but a portrait of America itself as it rots from the inside. Obviously, this is not your average movie about low lifes and gangsters. In fact the tagline: "In America You're On Your Own" pretty much says it all about where this movie is coming from. It opens in US theaters on October 19th. There are a handful of more positive reviews. Wilborn Hampton (Huffington Post) used words like "inspired" and "imaginative". 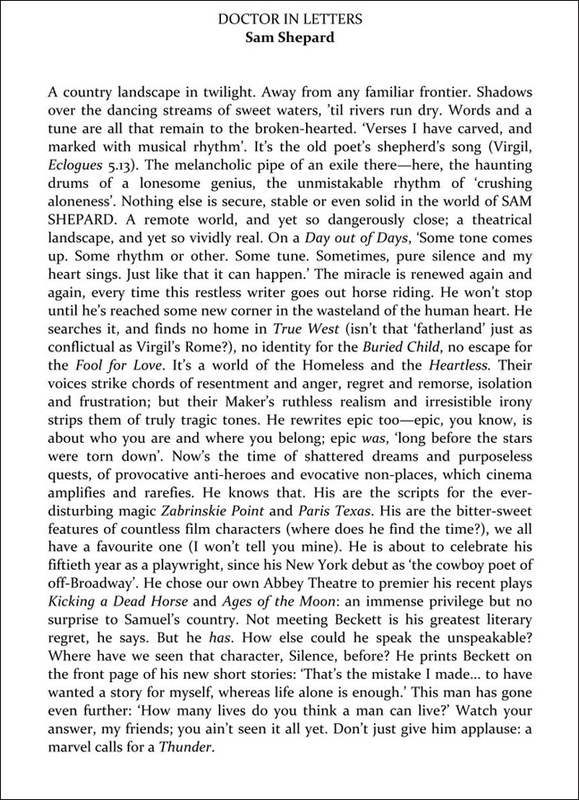 Michael Feingold (Village Voice) thought it was Sam's best play since "Fool for Love"! Of course, this is from a Columbia/Yale graduate. Ben Brantley (NY Times) outlandishly wrote, "As much as any American playwright, Mr. Shepard understands that every family is insane in its own special way." He's got to be joking. But Patrick Maley (Stage Magazine) agrees, "His plays dare us to realize that they present our own lives, if only we had the guts to look deeply enough inward." Perhaps these two gentlemen have been gobbling up too many of those dreadful TV reality (un-reality) shows. Dysfunctional families are not the mark of American life though they make for fascinating and disturbing drama. My jewel is Edward Albee's "Who's Afraid of Virginia Woolf", but in the real world, George and Martha are completely off the radar. Ultimately, it comes down to audience satisfaction, and from every source I've tapped into, they are unhappy. The consensus reads, "What was going on in this play?". You shouldn't need a degree in drama to get it. True, fans of Sam's plays are a strange lot. Almost a cult. We love the lyrical prose, the wry humor, the familial ruckus, the volcanic outbursts, even the crazy props, but it is imperative that we make some sense of it all. At this point, you have to wonder if the play will ever be staged again. 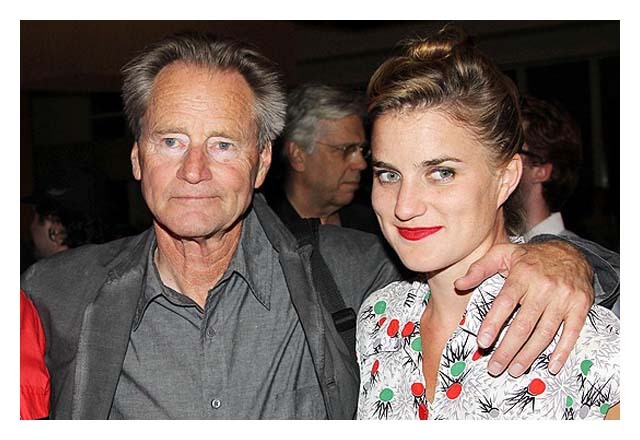 Opening night also presented a chance for another father-daughter public appearance. Here's a photo of 26-year-old Hannah with her dad. You may remember she accompanied him on his European trip in April. It appears that the #1 celeb on Monday night was Julia Stiles. Mike Vilensky of the Wall Street Journal reports, "The after-party lured out a mix of actors, critics and theater enthusiasts. 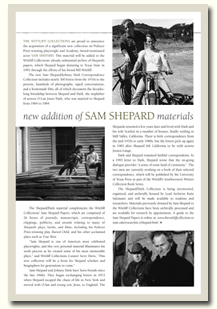 Mr. Shepard, characterically obscure, declined to grant any interviews." Hence, Mr. Vilensky spoke with the young actress. "'La Turista' is one of my all-time favorite plays. I've always admired him from afar." 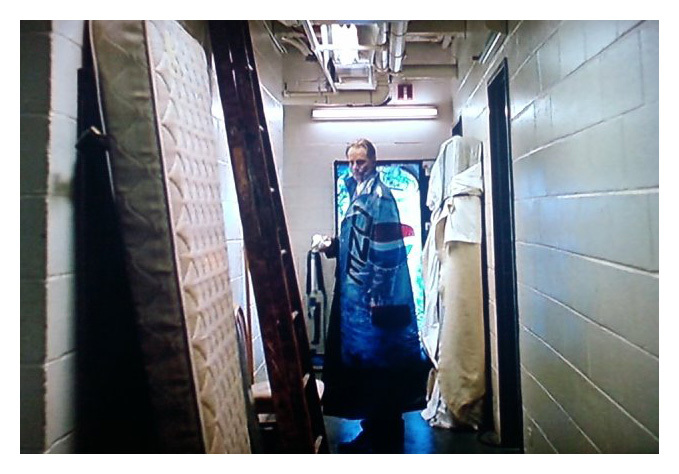 Ms. Stiles said she once had the opportunity to work with the playwright on a modern-day version of "Hamlet", in which she played Ophelia and Mr. Shepard played The Ghost (standing here in front of a Pepsi machine). 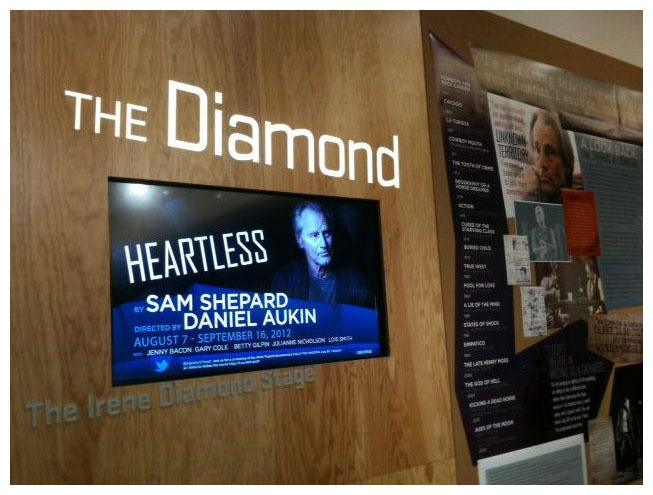 It was opening night at the Signature Theatre last night for Sam's new play, HEARTLESS, and some of the reviews felt a bit heartless, though they were honest. 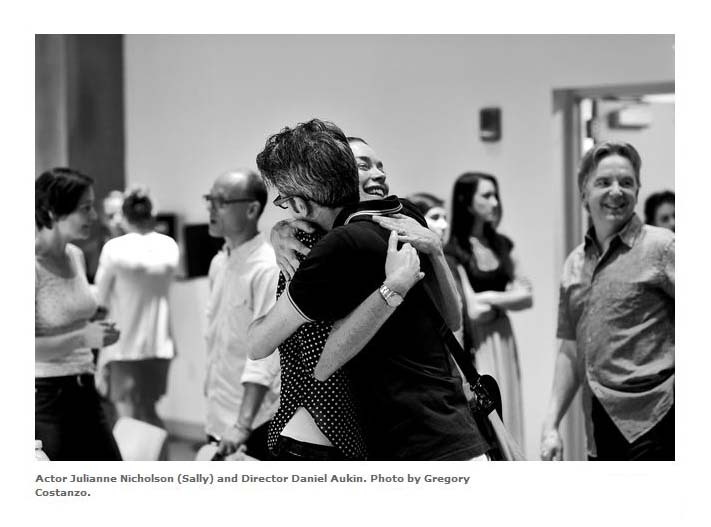 Ben Brantley of The New York Times used words like "murky". As a long-time admirer of Shepard's works, Mr. Brantley was kind in his review and gave credit where credit was due. But, ultimately, he admitted, "As for any secure sense of identity, forget about it. Shadows and substance blur confusingly, and personal histories seem to change on a whim." That sentiment runs deep through many of the reviews by theater critics as well as audiences. Check out the reviews. 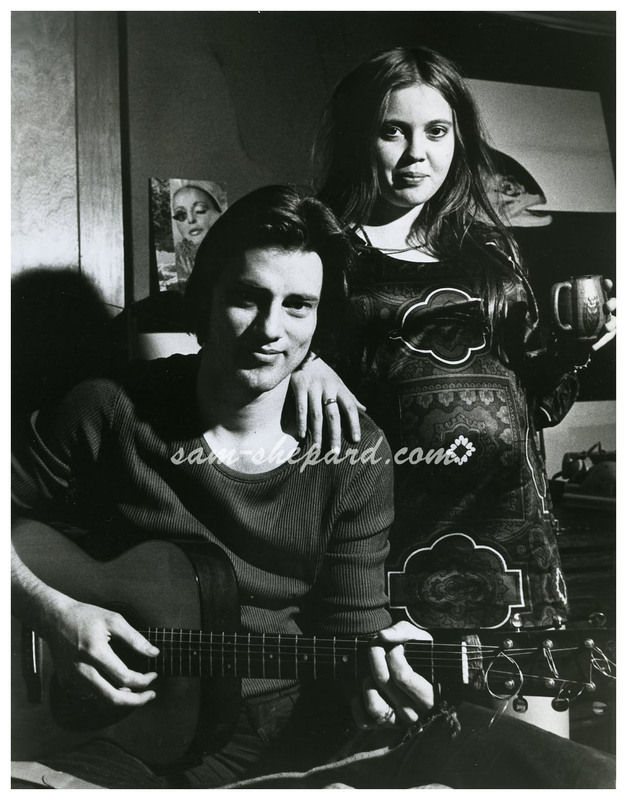 Don't you love the photos of Sam and Lois? So sweet... More photos here. According to Variety, Sam is in negotiations to play family patriarch Beverly Weston in The Weinstein Company's adaptation of the Pulitzer Prize and Tony Award-winning play "August: Osage County". Tracy Letts’ darkly comic drama is rich with compelling characters and scintillating criticism of the modern American family. 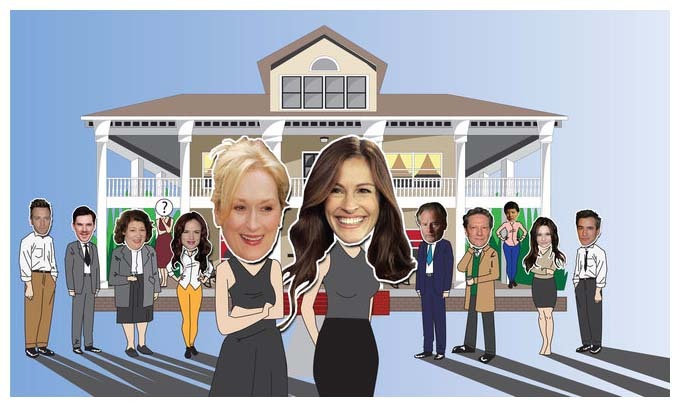 The family matriarch is being played by Meryl Streep and other cast members include Julia Roberts, Dermot Mulroney, Juliette Lewis, Chris Cooper and Abigail Breslin. The patriarch is described as a father to three daughters, a one-time world class poet and full-time alcoholic. Polite, soulful, melancholy, and ultimately suicidal. Sounds like a great role for Sam though his screen time will be short since he soon disappears. Filming will begin next month in Oklahoma. HEARTLESS has its official premiere tonight! 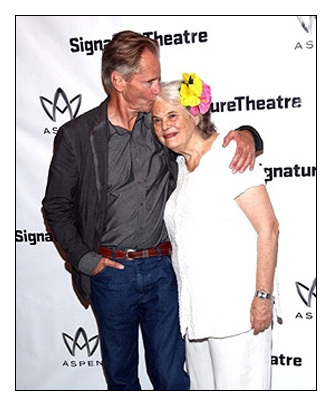 Yesterday Joe Myers of CT news wrote the following article called In Praise of Lois Smith - in England, she'd be a Dame. The new Sam Shepard play "Heartless," which officially opens Monday night at the Signature Theatre in Manhattan, is a real head-scratcher. I’m hoping that the reviews published on Tuesday will help unravel some of the mysteries in this tale of a highly dysfunctional Southern California family. Shepard has never been one of our easier playwrights — he doesn’t believe in conventional structure or immediately sympathetic characters — but he has succeeded in grabbing audiences with plays like “True West” and “The Curse of the Starving Class” that take on a more conventional dramatic shape. With “The Tooth of Crime,” “Buried Child” and now “Heartless” a theatergoer is left to his or her own devices to puzzle out the abstract plotting and hard to pin down characters. 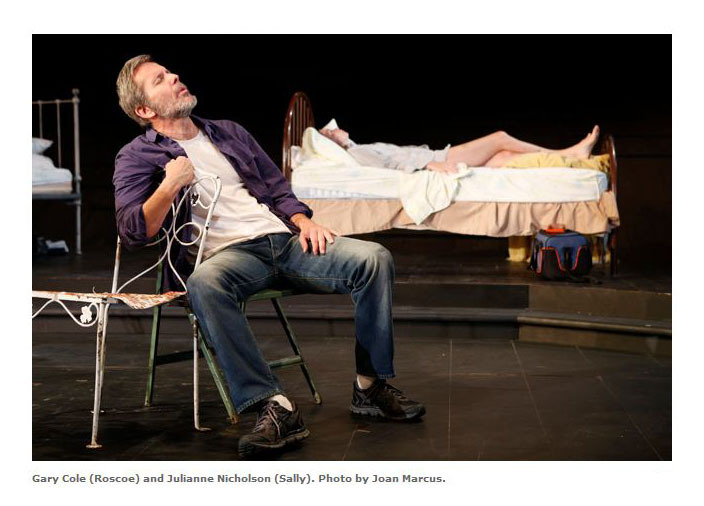 “Heartless” seems to be about Sally (Julianne Nicholson) inviting troubled academic Roscoe (Gary Cole) to crash at her place, where the suburbs meet the desert outside Los Angeles. Sister Lucy (Jenny Bacon) talks in riddles and is blatantly rude to Sally’s guest. A very strange nurse turns up — Elizabeth (Betty Gilpin) — who is caring for the sister’s outrageously angry and nasty mother, Mable Murphy (Lois Smith). Just when we think we have a handle on what is going on in “Heartless,” Shepard throws us a curveball — a suggestion that one of the characters is a ghost and that another might be some sort of walking dead person (after being the donor in a heart transplant). What held my interest and made me happy to be in the theater was Lois Smith as Mable Murphy. The 82-year-old actress has reached national treasure status after a long and distinguished career in theater, film and television (her credits range from “True Blood” to “East of Eden” and from “Twister” to “Next Stop, Greenwich Village”). 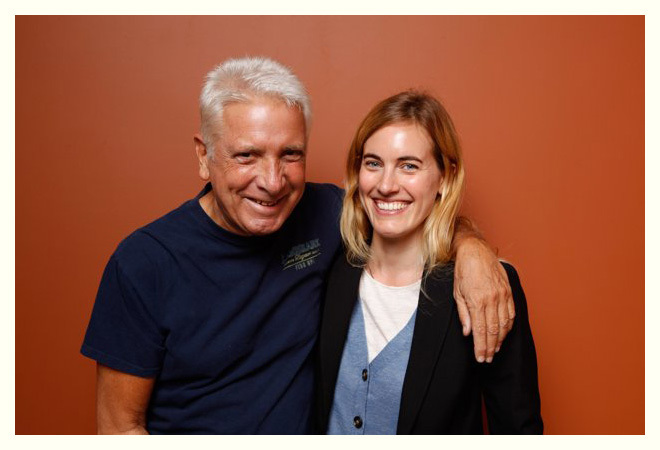 We have been lucky in Connecticut in recent years that Smith has chosen to work on major roles at Long Wharf Theatre in New Haven and at Hartford Stage. Smith has spent her golden years avoiding old dear roles in favor of daring unconventional parts like the witch in last season’s Signature production of the Tony Kushner play “The Illusion” and her unhinged mama in “Heartless.” The actress has the advantage of playing the one clearly drawn character in the Shepard play — a crazy, angry old lady who says whatever comes into her head — but what a pleasure it is to see a veteran performer still taking chances and still scoring in a career that has now spanned more than 60 years. 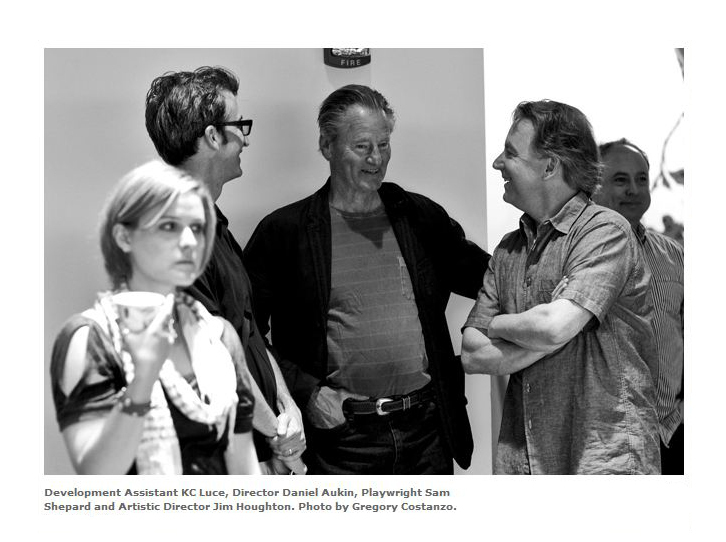 The world premiere production of Sam Shepard's latest play is now in previews at the Signature Theatre. Let me begin by confessing that I have always preferred Shepard the actor to Shepard the playwright. There is something about his subject matter, his blend of humor, drama, lyricism and the absurd that has rarely appealed to me. Seeing Heartless has not made me a convert. The action takes place at a home overlooking Los Angeles inhabited by two sisters, their wheelchair-bound mother and her mysterious nurse. The younger sister, who has a huge scar running down her torso, has invited an older professor of Spanish literature, who has run out on his marriage, to move in. What follows is a hodgepodge of half-developed ideas that do not lead anywhere. Just when a situation gets interesting, Shepard drops it and goes elsewhere. Shepard does give each member of the fine cast (Jenny Bacon, Gary Cole, Betty Gilpin, Julianne Nicholson and Lois Smith) a chance to shine. I found Gilpin and Smith especially strong. Cole looked a bit too young for a 65-year old. Eugene Lee's bleak set makes awkward use of the stage, wasting most of the available space and thrusting into the front row of seats. Daniel Aukin's direction seemed sluggish, but that could just be the play. It was a frustrating evening. Running time: 2 hours, including intermission. I like whimsy so I offer this HEARTLESS cartoon in the spirit of Al Hirschfeld. 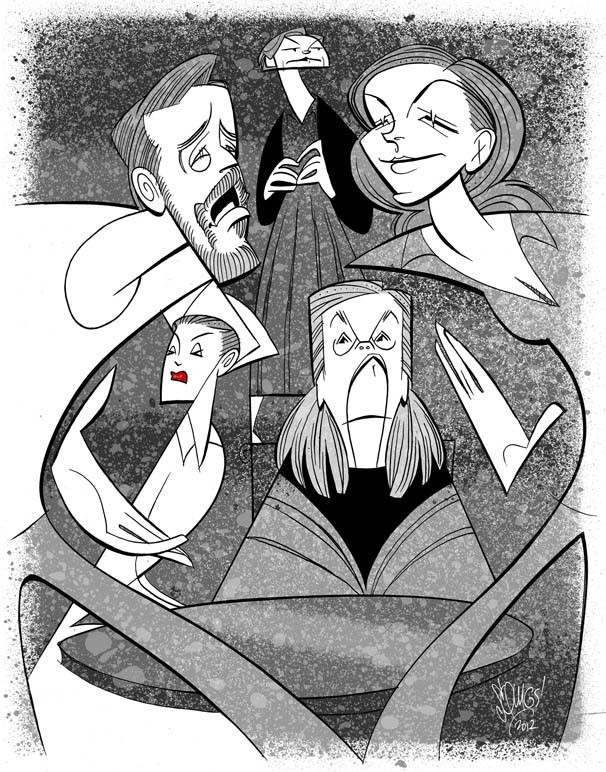 Broadway.com resident artist Justin “Squigs” Robertson headed to the Irene Diamond Stage to watch the family drama unfold and then sketched this dreamy portrait. 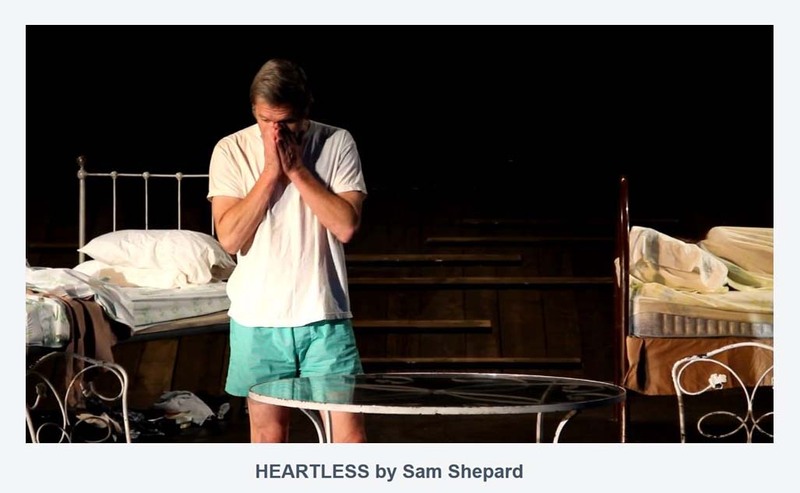 Sam's new play, HEARTLESS, was set to close on September 16th, but the off-Broadway production will now be extended through September 30th after completely selling out its initial run. Tickets, originally priced at $25, will now cost $75. NYC's Mayor Bloomberg happened to catch the play this week and had nothing but praise - "Great theater! Great acting! It really was great theater. I still can't figure out what one character was but that's what playwrights should do. They should make us think and I certainly have talked about it since." When you first read the script for "Heartless", what did you think? 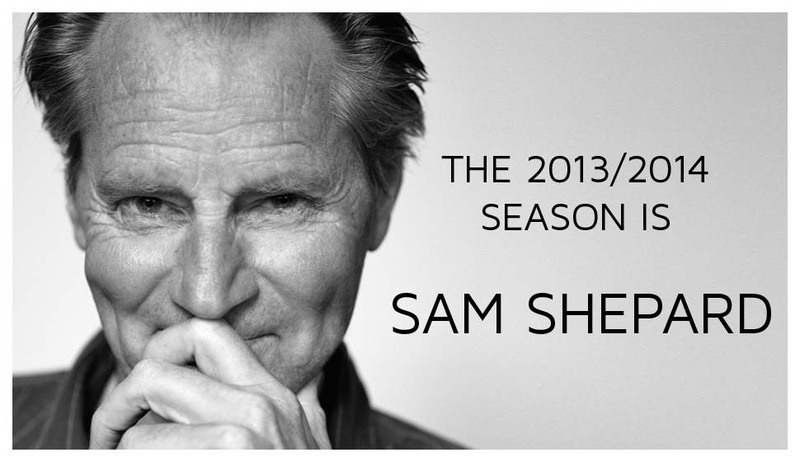 Gary: Four words: Sam Shepard, new play. I didn’t need more than that to get excited. I’ve been a huge fan of Sam’s for so long, and I did lots of his plays early in my career... When I read "Heartless", I was as engrossed as I usually am when I read him, whether it’s a play or a short story or a book, because his work is unlike anything else. It’s about families, and the west, and isolation, but with his own signature on it. It’s inexplicable, and that’s why it’s so compelling. You have to be there and witness it to get a real feeling of it. It’s not easy to convey unless you sit down and have a bowl of it. 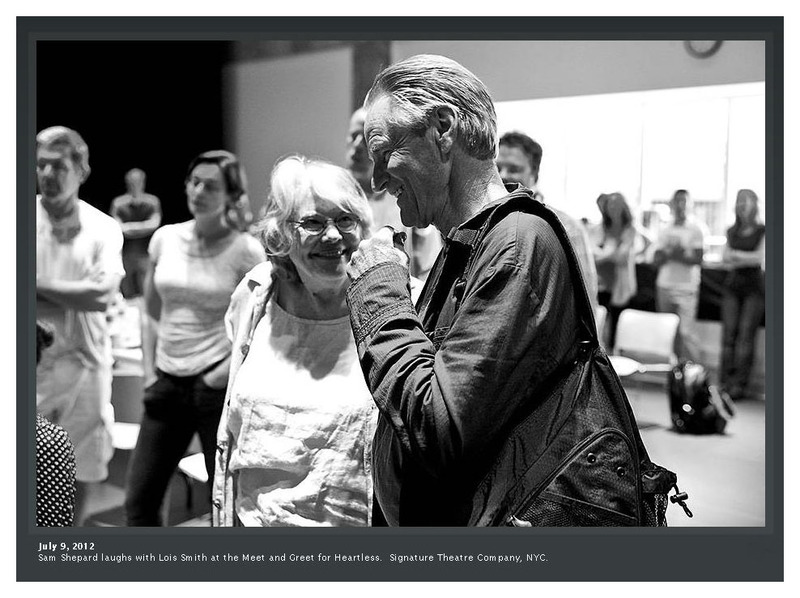 Gary: For a stage actor to be there with the words and the creator of the words, it doesn't get much better than that. When we first went into rehearsal, we didn’t know how the play was going to land, or what everything in it is supposed to mean. Daniel [Aukin, director], who has done a magnificent job, likes to go too far in either direction to test things out—too big and too minimal—which I really like. You’re meant to fail—that’s what rehearsal is for, especially in a play like this where it isn’t evident right away what the audience is supposed to be experiencing. It’s a living, breathing thing, and that’s what Sam has the talent of doing. Most playwrights don’t go into tremendous detail about what the set should be or what people are wearing, and Sam always does. It’s fully described in the stage directions before anyone even nails a nail. He’s thinking about every element of what a theater experience is. This play has a surreal quality and could be open to several interpretations—have you, Shepard and the cast decided on one? Gary: Sam does have one, but he doesn’t force it on anybody. It means something to him personally, but it’s left open to live on its feet. We’re having a talkback tonight, and people are going to ask, “What does the play mean?” My answer to that is always, “That’s not a question I should be answering. That’s a question you should be answering.” It’s a visceral moment and a connection in that theater that’s happening to your senses and your brain, and you can’t dictate it. Gary also informs us that the play includes one of Sam's telltale scenes of food abuse. In "True West", the actors threw around toast; in "Curse of the Starving Class", artichokes took a beating. Now the audience will be treated to a "doughnut sequence". As we know, Sam attended rehearsals and Gary's comment was, "Sometimes he'll reflect on something that he just saw, or make a suggestion, not about what's happening on stage, but about where it came from, the idea behind what he's written, with the idea that it's helpful for actors to get at it." And finally, here's Gary's thoughts on the play's themes - "It has to do with family and family history, and issues and crises that confront the family: abandonment and infidelity and all those kinds of things, but woven in such a way that it really is only to be witnessed. But it's not linear in the way that some of his plays have been. It takes place in what our image of Los Angeles would be, but there's no time necessarily defined. 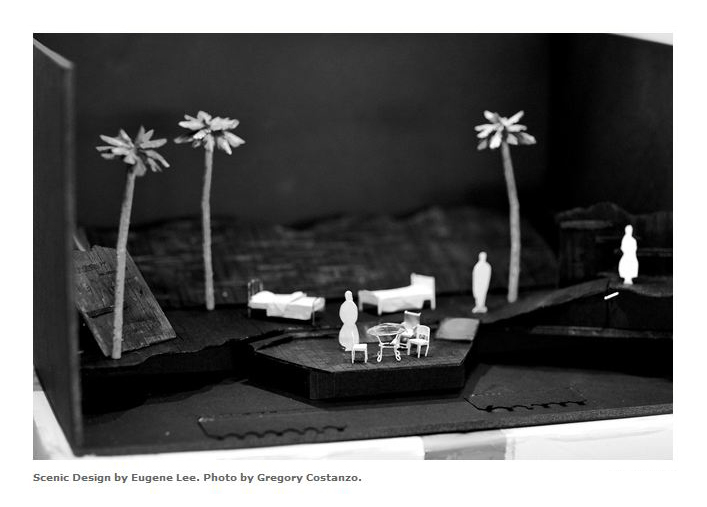 It's an L.A. house that is high above the city." 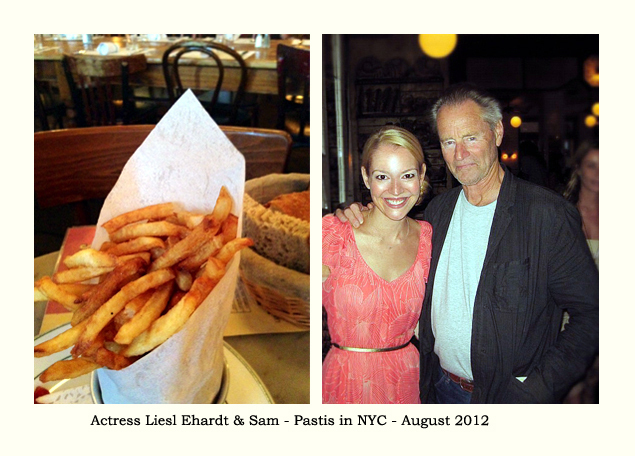 Over the weekend Sam was spotted dining at NYC's Pastis. It so happens that a blogger was also dining there that night in celebration of her 33rd birthday and posted these photos. Not only did she get treated with her favorite french fries, but also a photo with our playwright. I must say those french fries do look enticing! You may recognize the gal from her role as the cutesy stewardess who undresses for Don Draper in the "Mad Men" series. After a strong Cannes debut, the long wait for a distributor for the Jeff Nichols film MUD is over! Lionsgate and Roadside Attractions are acquiring the rights to distribute the film in the US. Though they've announced it will be released in 2013, there are no further details as to what month. Matthew McConaughey stars as Mud, a man who's hiding from the law on an island in the Mississippi River. While there, he meets two young boys (played by Tye Sheridan and Jacob Lofland), who agree to help him. Also co-starring with Sam are Michael Shannon, Sarah Paulson and Reese Witherspoon. MUD was filmed in Arkansas last fall. Jason Solomons, critic for the UK Guardian, wrote, "Mud is a very fine film about innocence, father figures and love, a work that manages to be thrilling, unsentimental and emotionally rewarding." Variety critic Justin Chang said Nichols' film conceals deep emotional reserves beneath its respectively arch and conventional surfaces while Variety critic Peter Debruge said, "Jeff Nichols' third feature arrives already feeling like a classic, partly because it echoes Huckleberry Finn, but also because it so elegantly addresses what masculinity and family really mean in the heartland." Hollywood Reporter Todd McCarthy described the film as "a well carpentered piece of work marked by some fine performances and resilient thematic fiber." A blog from Outing the Actor: HEARTLESS hasn’t opened yet and I don’t want to give away anything about the plot. Please go and see it for your own good. It is not an easy play to watch. We were seated almost under the stage and I had to crane my neck, which was already sore, in order to watch the action. But after a while I felt that my discomfort was actually contributing to my personal involvement in this superb play. Two outstanding elements make it, in my judgment, ‘successful.’ Actually three, now that I think about it. I was going to say the writing of the script and the sensitive acting, but then I realized that the brilliant direction connects these two like the third leg of a triangle. Shepard has always been able to boil down earth-shaking themes such as brotherhood, ‘familyhood’ and corporate greed and feed them through simultaneously believable and crazy characters - and then make the whole stew go down easily with a liberal sprinkling of humor. But here Shepard takes on a man vs. women theme with the intensity of a Greek tragedy and pulls it off through actors, who literally turn themselves inside out. There’s no preaching in this play. People talk, well… not naturally, but in the way people might actually speak when they have a lot on their minds, and they do plenty of interesting things and by the time they’ve reached the end of the play, they reveal that the qualities they seemed to project at first are the polar opposite of who they really are. The ensemble work of the actors is terrific; whether utterly attuned or viciously dissonant they continually speak ‘from the heart or heartlessness’ that defines their core. The emotional life is so tangible that we can’t disconnect for an instant. If we allow ourselves to listen, we are riveted – and when it is over we know that we are them and they are us – and in one way or another, the terrible arc of their lives is ours. I can imagine what it must have cost Shepard to come up with this kind of honesty, but it is hard to imagine how the actors go on night after night shivering with emotion like leaves in a particularly icy wind. 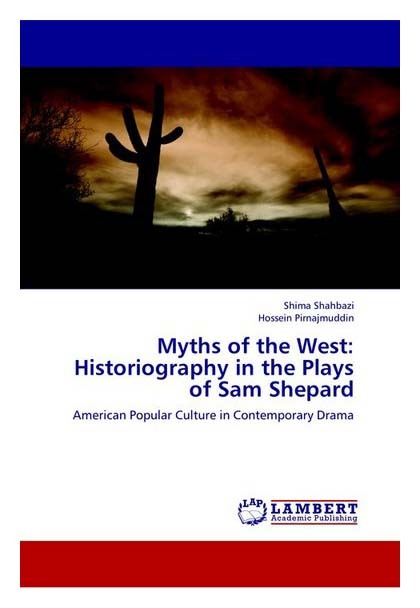 Lambert Academic Publishing (LAP), one of the leading publishing houses in academic research, has released the following book by Iranian authors Shima Shahbazi and Hossein Pirnajmuddin - "Myths of the West: Historiography in the Plays of Sam Shepard". The book has 240 pages and was published on August 9, 2012. 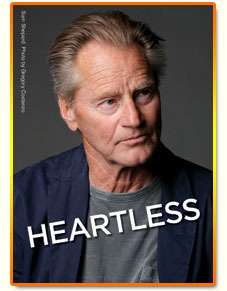 The synopsis reads: A concern with myths is central to the drama of Sam Shepard, one of the leading figures in contemporary American drama and culture. What is the modality of this mythic orientation and its relation to American history and culture? In an attempt to answer this question, the writers focus on the recurrent theme of the hope to find order and meaning in the present by coming to terms with the haunting specters of the past in Shepard’s plays. They look into the visionary quests of Shepard’s characters for identity in the Old West in relation to the American Dream. Central to their analysis is the playwright’s historiographic reading of the past through ‘myths’ that bear the values of the popular culture and the highly parodic presentation of the old myths in the postmodern era. The writers shed light on the bonds between today’s culture and the past values of a nation formed into myths. They probe the unique way Shepard approaches these myths as a means of reviewing the past from a critical point of view. 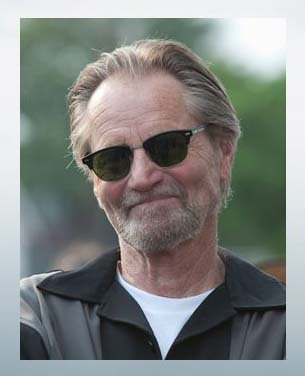 Those interested in historiography of the American culture, especially American pop culture, and Sam Shepard’s drama will find the book a valuable source. 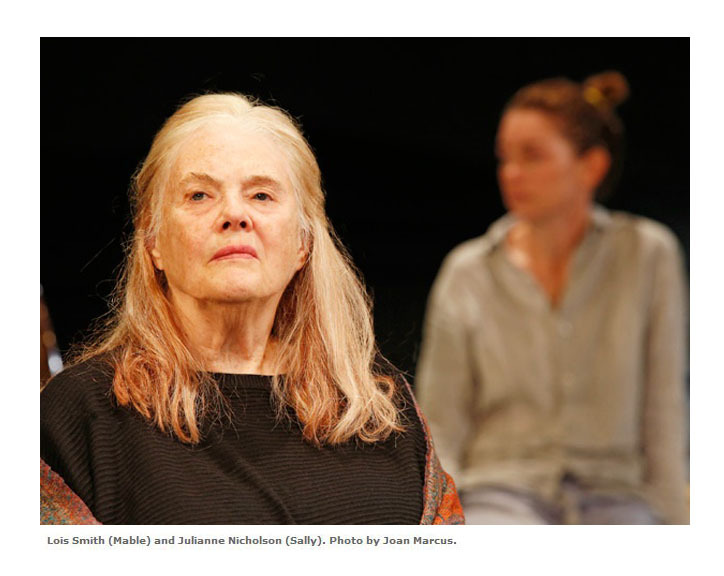 In an interview with "Heartless" cast member, Lois Smith, the actress commented on her most challenging stage role: "'Buried Child' is hard to talk about because the mystery of that play is so deep and primal. It's a family saga like no other, and so is Sam's new play; they are deep and challenging, but also very exciting." Here's a link to a video showing several scenes from the play. A female blogger's review just showed up and, again, it echoes previous comments about the new Sam Shepard play. It just doesn't succeed. She thought the play could be on its way to being amazing but in the meantime, there was definitely a struggle in understanding it. Described as having an "uneasy balance between magical realism, absurdism and the supernatural", the drama also revealed itself to have a strange disconnect between its directorial staging and the dialogue. And yet, at times the blogger was completely captivated and transported by the majesty of the language. 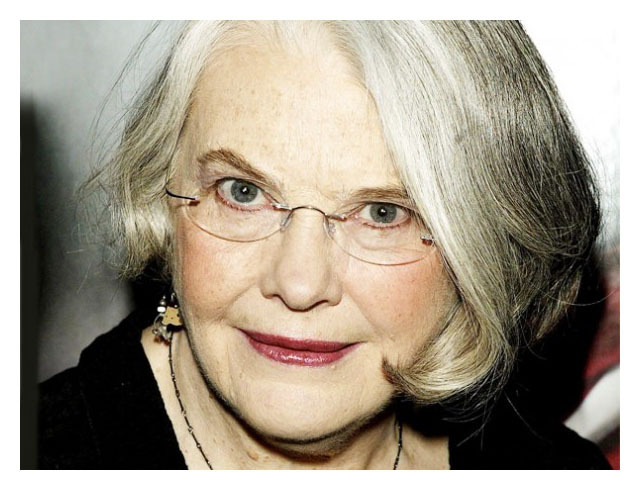 She gave all the actors high marks with Lois Smith described as "revelatory". 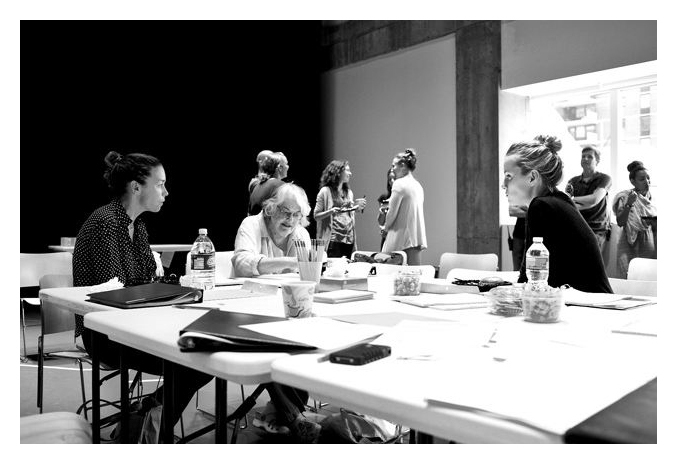 She also shared a rumor that our playwright is at the theater every night taking notes and making changes. Certainly audiences want to be challenged as well as be entertained, but the story shouldn't play out like some impossible brain game. "It's tough to live up to all that past acclaim. I don't believe Sam Shepard's latest play is meant to be a comedy -- but maybe I'm wrong -- certainly there was a lot of laughter coming from the audience during the second act. Especially when the homely older sister who had abandoned any thought of a normal life in order to stay and care for mother announced, 'This is so _____ up!' The acting was good, but I think the only performer who successfully furthered his career was the offstage dog who barked on cue, jangled his lease realistically, and never had to show his face to the bemused observers." "Sam Shepherd struggling with tormented souls screaming out their anguish and listening to silence in awkwardly long interludes of emptiness. I suspect the laughter was due to a sympathetic audience willing the actors on. An experience which, quite frankly, is an ugly pearl for the initiated only. The offstage dog was great." "I liked 'Heartless', and I thought it was not so much surreal as supernatural, with a bit of a No Exit/Twilight Zone feel. It seemed to me the characters all had one foot in the grave and one out of it... 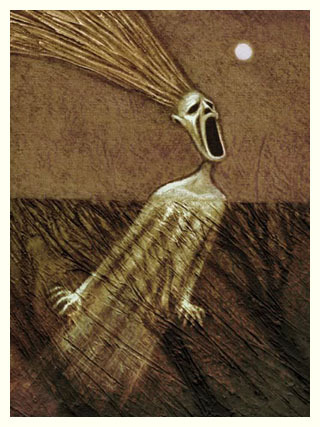 The play opens with a banshee's scream..."
"I ended up seeing this tonight and couldn't really make heads or tails of it. My friend and I walked out saying, 'What was going on in this play?!' I don't know what Shepard was saying here, but he and I were not on the same wavelength! The acting was all good, with Lois Smith being her usual excellent self; she threw off many one-liners that were pretty funny, but ultimately they didn't add up to anything coherent enough for me. It was kind of surrealistic, often feeling like an Albee play. I kept waiting for a character to have a big reveal and tie some things up, at least thematically. It was clear early on we weren't going to get a straightforward story, and that's fine, but it never brought anything together and left me scratching my head." "I saw it last night, and for a second preview, I thought it was in really great shape. A totally weird play that I kind of loved. I think I need a couple of days to process what it is all about, but I was totally with it the whole time, and there were parts that were totally fascinating. I'm looking forward to going back again in a couple of weeks and seeing what my second experience is like. The cast is uniformly excellent. Julianne Nicholson is really amazing, and Lois Smith (who I always love) is playing a part like I've never seen her play before. 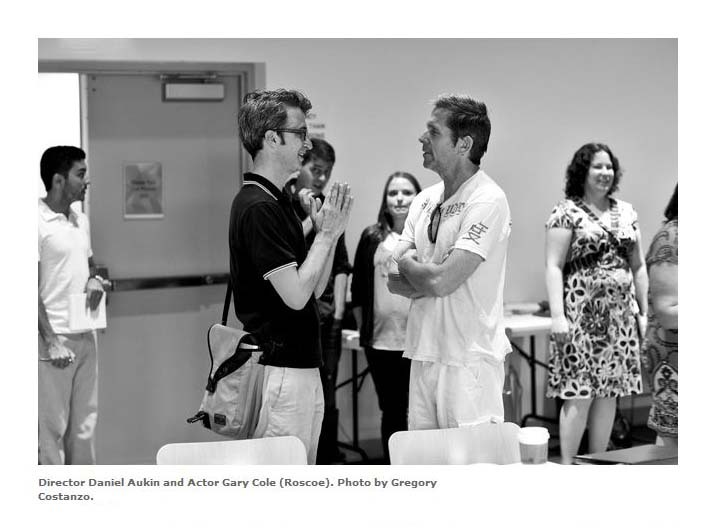 I've never seen Gary Cole on stage before and he was a great straight man. Really solid. Bacon and Gilpin were good too. As an added benefit, it's only 2 hours with an intermission." "I saw it Saturday... I thought it was OK. I was in Row M and one of the crucial scenes was on the opposite side of the state and [they] were speaking so softly, it was tough hearing. The cast was good and it's always good to see Ms Smith. So, Mr. Aukin, tell them to speak a little louder." According to French magazine Versatile, Sam's book "Day out of Days" will be released in France as "Chroniques des jour enfuis" on August 29, 2012. I believe Journalist Olivier Coufourier should be chewed out for giving misinformation in his write-up on Sam. As for the cover of the new book, there seems to be a disconnect with the chosen photo. 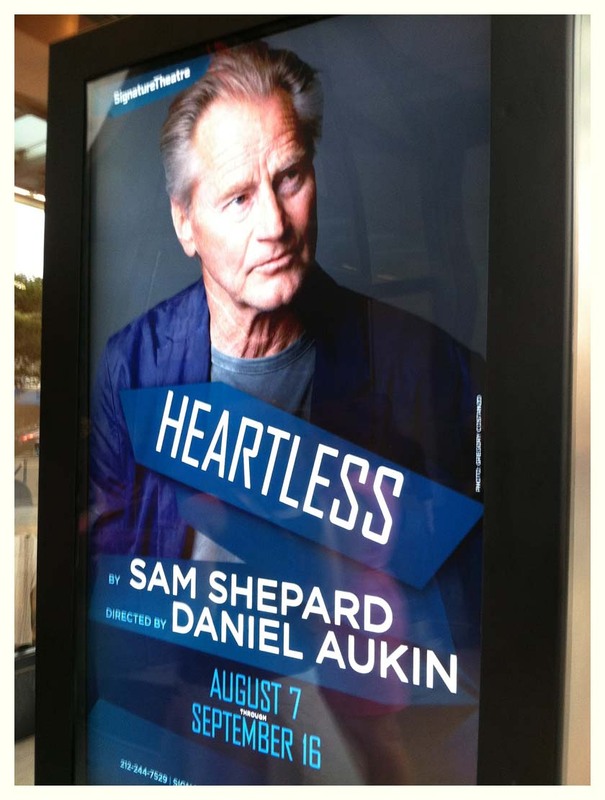 Though Sam's new play, HEARTLESS, opened on Tuesday evening, apparently the press isn't invited until the official premiere at the end of the month. But one could expect an anonymous blogger might say a few words. The Facebook page for the Signature Theatre Company simply states "'Heartless' is up and running" (8/8) and "Spotted Winona Ryder in the audience last night" (8/9). Cast member Jenny Bacon was interviewed during rehearsals and asked if she was a Shepard fan. She responded, "Everybody has their 'first time I read Sam Shepard or I saw Sam Shepard'... He’s so very much a poet of our time. He speaks so strongly to so many of us." Back in April, Sam met with British director Irina Brook in Paris to work on her staging of "Peer Gynt" for the Salzburg Festival. The play premiered on July 30th with the media describing it as an "unconventional interpretation of Henrik Ibsen's drama". The multi-cultural theater spectacle with numerous musical interludes included a veritable rock concert as well as sequences from Edvard Grieg's Perry Gynt Suite for Orchestra, which provided some Nordic atmosphere. 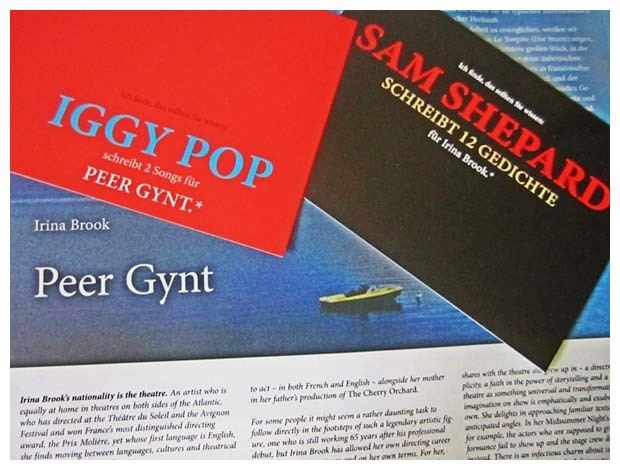 Contributors included rock artist Iggy Pop, who wrote two punk songs about the rise and fall of a rock star while Sam wrote twelve poems which were delivered in monologues by the play's lead, Icelandic actor Ingvar E. Sigurdsson. The 14-member cast, which included performers from Lebanon, Japan, France, Australia and Italy, gave the audience an evening of dazzling acrobatics, imagery and music. However, according to reviews of the premiere, the audience was split over this unusual version of the classic play when many booed at the break and left the theater but those who stayed applauded vigorously at the end. It's official! Treva Wurmfeld's documentary, "Shepard and Dark" will be featured at the Toronto International Film Festival next month. 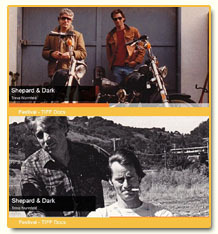 The festival synopsis on the 92-minute film reads: "Director Treva Wurmfeld captures an indelible portrait of the complex relationship between playwright/actor Sam Shepard and his close friend Johnny Dark as they prepare forty years of their correspondence for publication, stirring up old memories both good and bad." 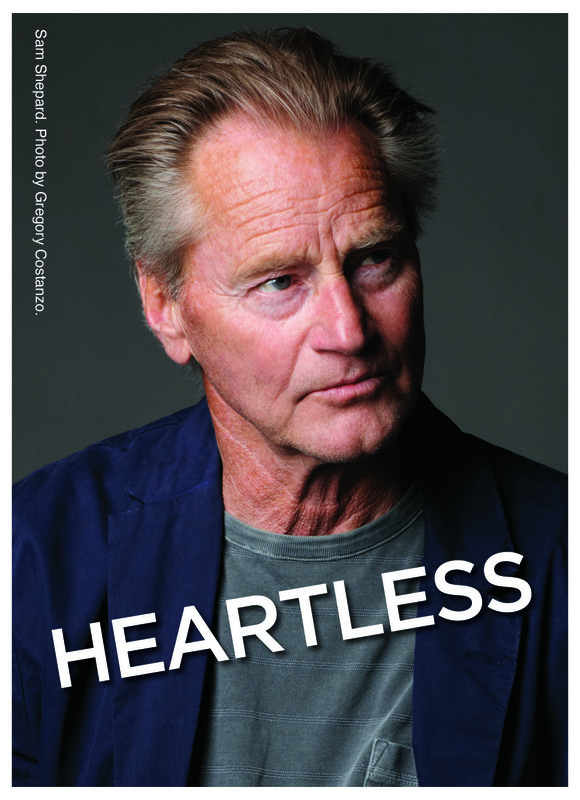 From the NY Times (8/3/12) - "Details have been scant about 'Heartless,' the new play by Sam Shepard that begins an Off Broadway run this week, but for Shepard fans it hardly matters. It’s new, and it’s by the man who won a Pulitzer Prize in 1979 for 'Buried Child.' In that play he dealt with submerged secrets, and in 'Heartless' dark secrets are at issue too, but Mr. Shepard is not simply playing in an old sandbox here. This writer known for many a testosterone-fueled battle (see 'True West,' 'The Tooth of Crime' and others) has — perhaps surprisingly — written a play predominantly populated by female characters." The photos below show Sam being introduced to South African playwright Athol Fugard for the first time by Artistic Director James Houghton. Fugard's play, "The Train Driver", will also open this month at the Signature. Here's a peek at Sam's classic typewriter and a photo of the window display at the theatre's bookshop. Previews begin on Tuesday!!! 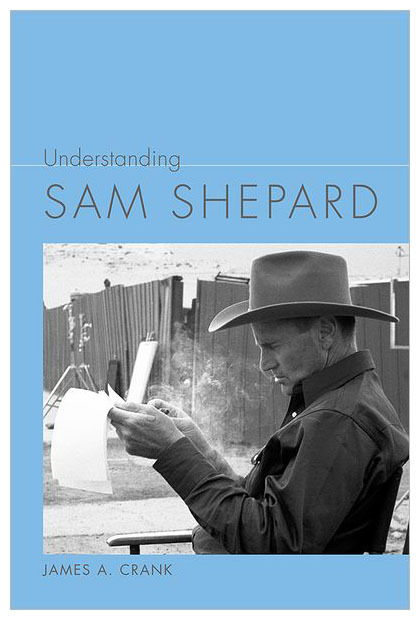 Understanding Sam Shepard investigates the notoriously complex and confusing dramatic world of Sam Shepard, one of America's most prolific, thoughtful, and challenging contemporary playwrights. 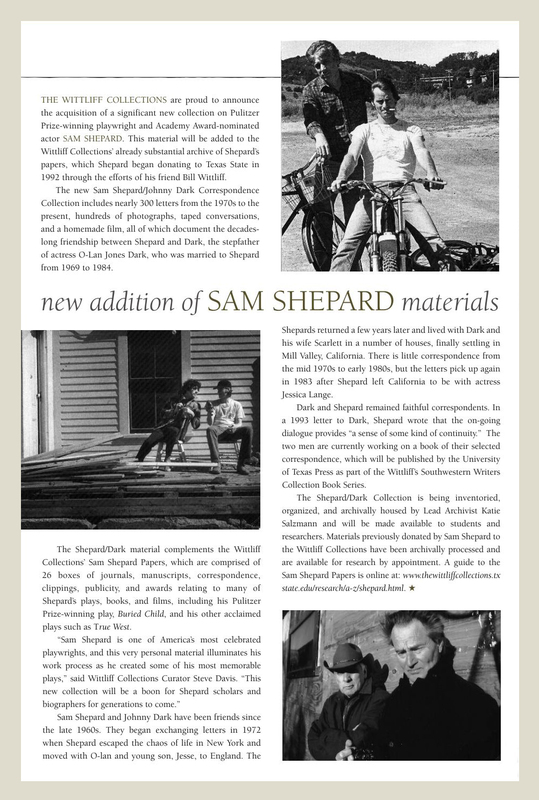 During his nearly fifty-year career as a writer, actor, director, and producer, Shepard has consistently focused his work on the ever-changing American cultural landscape. James A. Crank's comprehensive study of Shepard offers scholars and students of the dramatist a means of understanding Shephard's frequent experimentation with language, setting, characters, and theme. 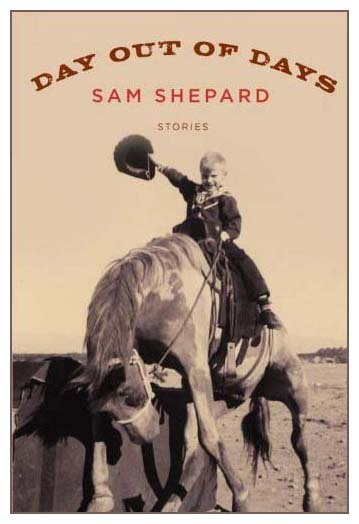 Beginning with a brief biography of Shepard, Crank shows how experiences in Shepard's life eventually resonate in his work by exploring the major themes, unique style, and history of Shepard's productions. Focusing first on Shepard's early plays, which showcase highly experimental, frenetic explorations of fractured worlds, Crank discusses how the techniques from these works evolve and translate into the major works in his "family trilogy": Curse of the Starving Class, the Pulitzer Prize-winning Buried Child, and True West. 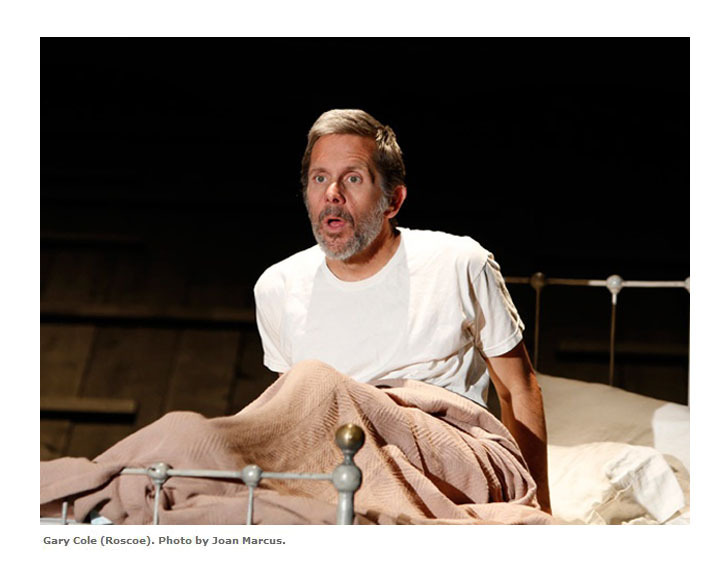 Shepard often uses elements from his past - his relationship with his father, his struggle for control within the family, and the breakdown of the suburban American dream - as major starting points in his plays. Each year Filmmaker Magazine puts out a list of talent worth keeping an eye on in the independent film world. 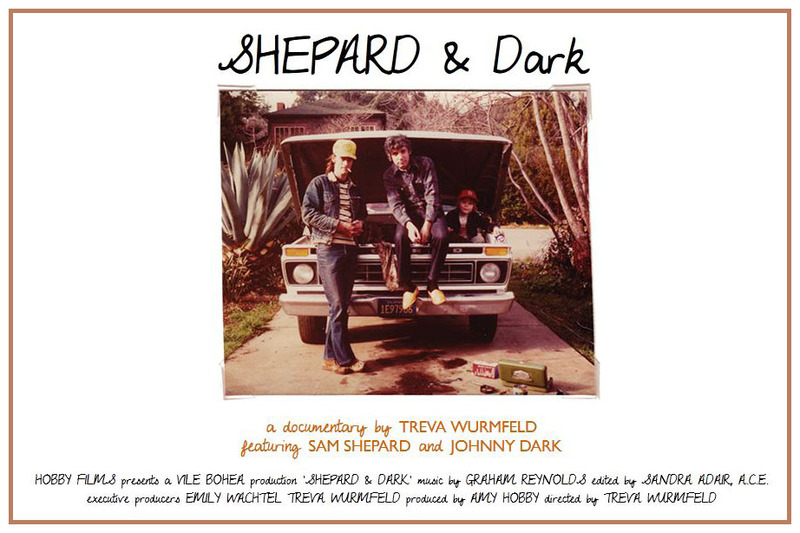 This year Treva Wurmfeld appears on the annual list with the promise of her film, “Shepard and Dark,” a documentary that chronicles the 40-year relationship between Sam and Johnny Dark, stepfather to O-lan Jones, whom Sam was married to from 1969 to 1984. Johnny is described as a "quiet writer and archivist who works days behind the counter at a Santa Fe deli." 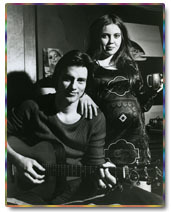 Treva originally met Sam while working on "Fair Game" and later reconnected with him through director Michael Almereyda and proposed a film. When she learned that Sam and Johnny were collaborating on an archival project for Texas State University, she knew she had the film's focus. Male friendship is the theme of her debut film explaining, "Theirs is a friendship that comes through in letter form where the boundaries of 'friend' and 'family' are blurred." You may recall that back in February 2011, I reported the addition of the Shepard/Dark Correspondence Collection as new material to the Wittliff Collections at TSU. It includes personal letters, photographs, taped conversations and a homemade film which documents their friendship. Post-production on the documentary, produced by Amy Hobby, was completed at Detour Productions with the help of Sandra Adair, who edited the film. 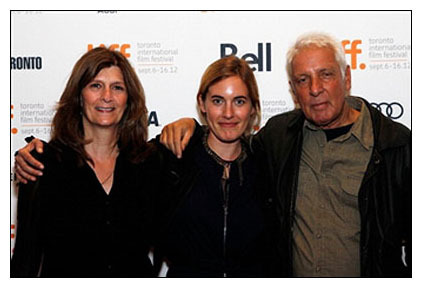 Treva says "Shepard and Dark" will make its world premiere at the Toronto International Film Festival in September. A photo of Sam and O-lan with a baby on the way! That would be son Jesse Mojo Shepard, born in May 1970. 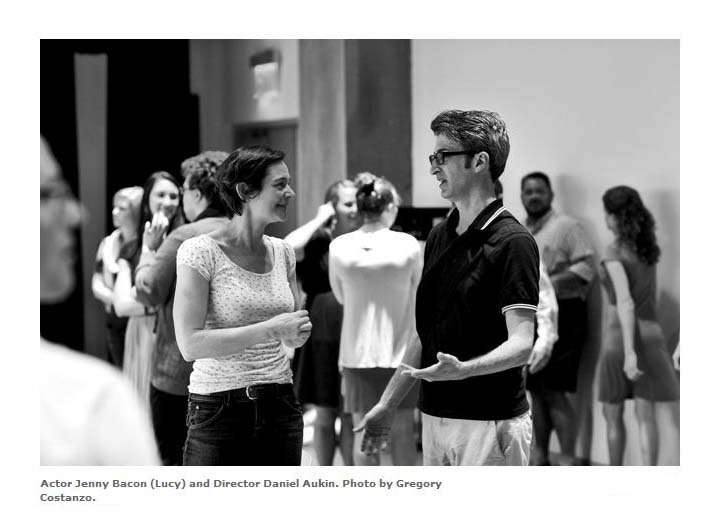 Tickets are on sale and rehearsals have begun for the Signature Theatre Company's world premiere of HEARTLESS plus the first photos have been posted! 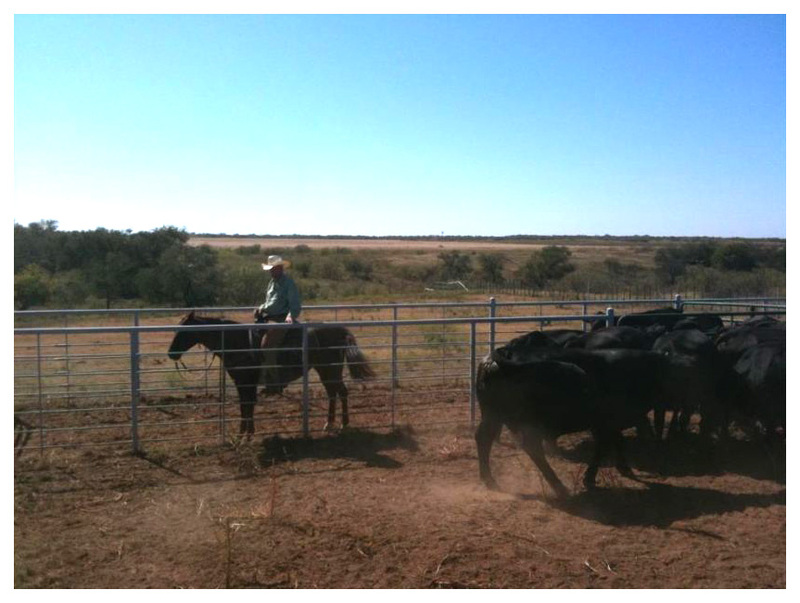 Sam returned from New Mexico earlier this month and checked in on the cast and crew. The highly anticipated drama stars Julianne Nicholson as Sally, Lois Smith as Sally's mother Mable, Jenny Bacon as her sister Lucy, Betty Gilpin as Mable's nurse Elizabeth, and Gary Cole as the visitor named Roscoe, whose presence threatens to unlock some of this strange family's secrets. You can watch a video at this link showing artistic director James Houghton discussing Sam's newest play. The so-called comedy, DARLING COMPANION, takes a bow on DVD and Blu-ray on August 28th. Though the film had a roster of great actors, the script by Lawrence and Meg Kasdan failed to evoke much laughter from both critics and audiences scoring a disappointing 21% on the Tomatometer. J.R. Jones of the Chicago Reader lamented, "Initially this struck me something you'd take your grandmother to see, but by the end, it seemed more like something your grandmother would take her grandmother to see." A chance to see Sam in a movie is always worth it so perhaps fans can catch it on Cable TV. 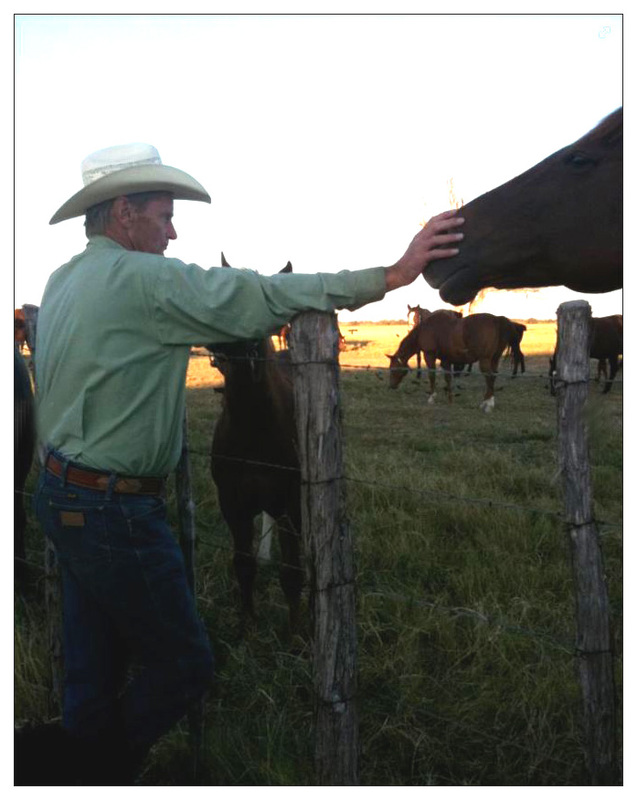 This week he's back in Santa Fe, where he makes his home these days when he's not on his horses in Kentucky. 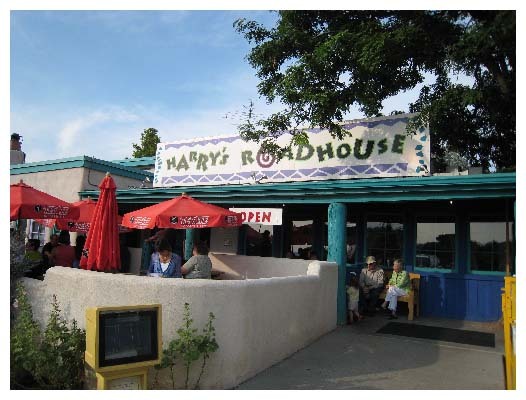 According to The New Mexican, he was spotted at Harry's Roadhouse chatting with locals about golf and his play, "True West". Apparently, this is a favorite hangout because other folks have mentioned seeing him now and again.